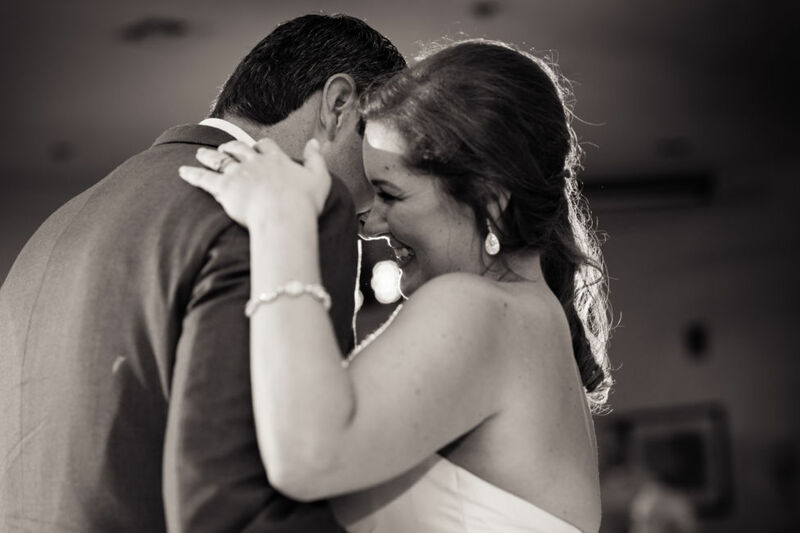 I think of the song, “The Look of Love is in Your Eyes” when I think of Evelyn and Daren. 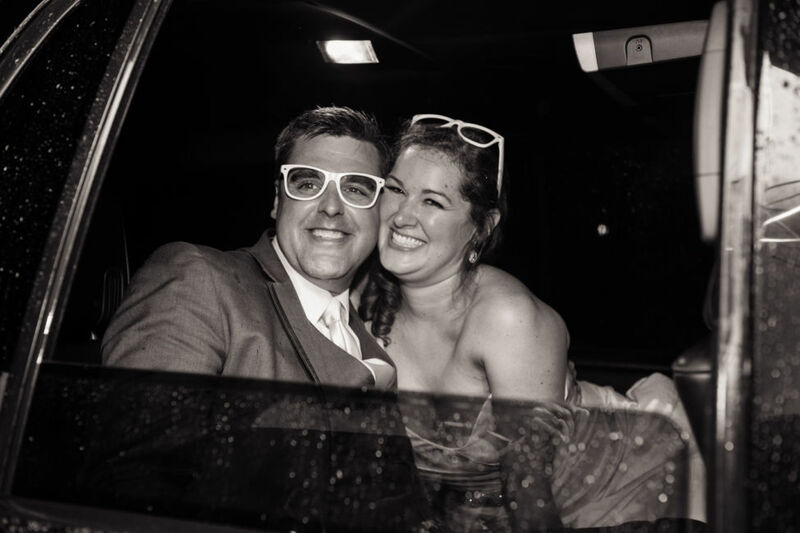 They are both very happy, upbeat people and smile continuously in each other’s company! 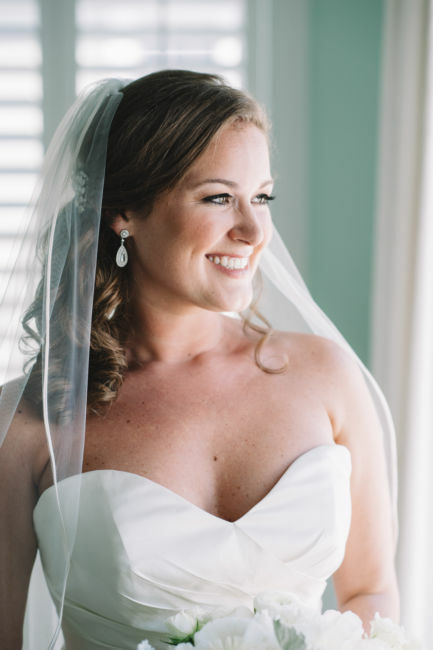 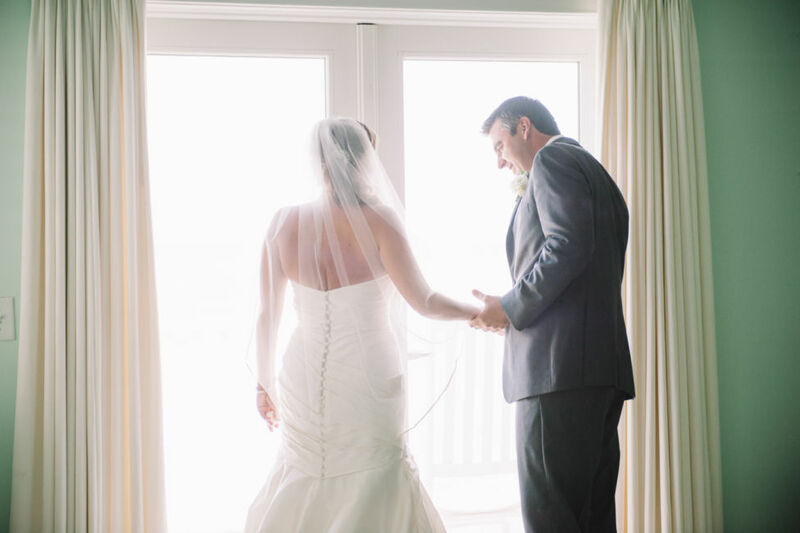 Their eyes say volumes as they did in their first look before the wedding ceremony. 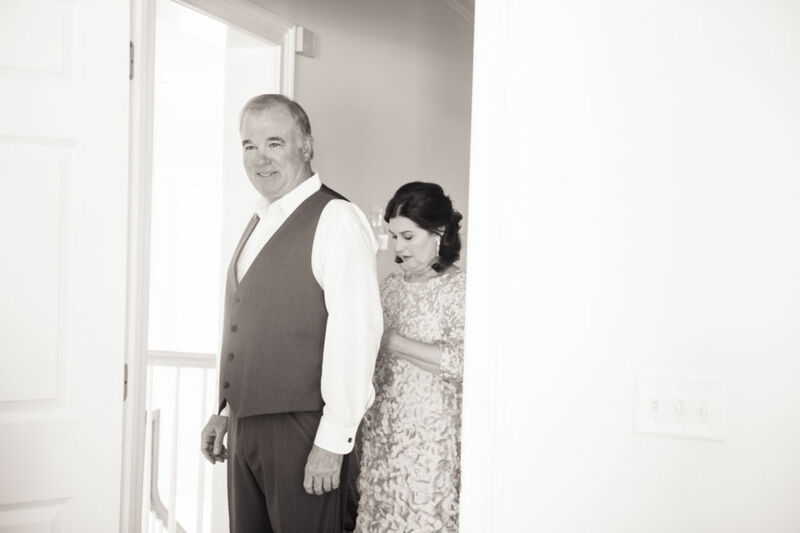 When mutual friends arranged for Evelyn and Daren to meet back in 2010, Evelyn wasn’t very optimistic about the evening to come. 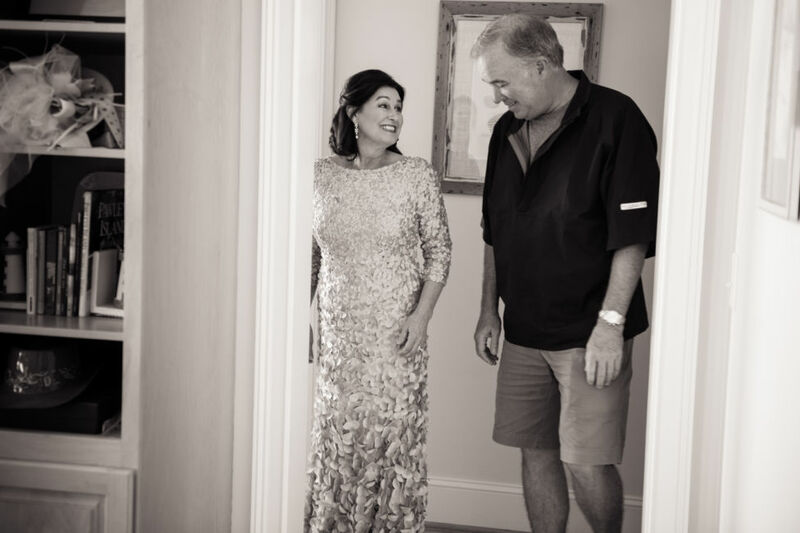 Little did she know, that Mexican restaurant meeting spot would be the first of many places to remember in their history together. 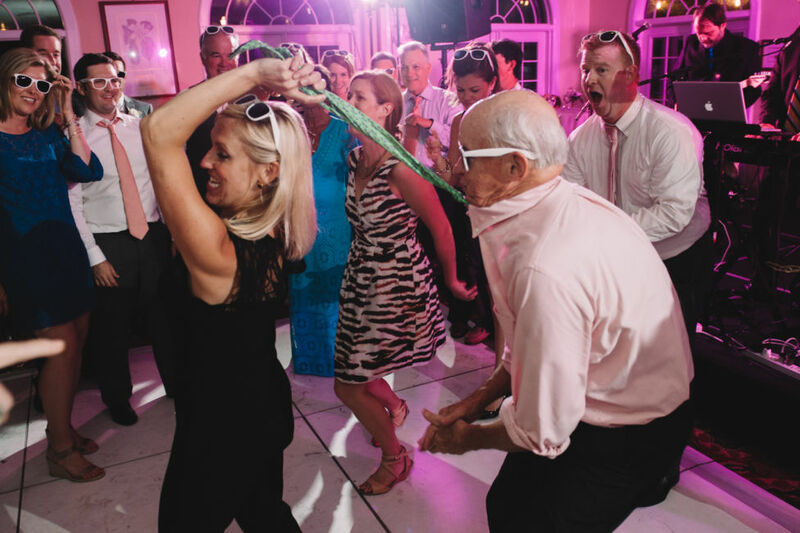 Evelyn and Daren hit it off from the moment they said their first hello, then enjoyed supper and continued the evening with skee ball. 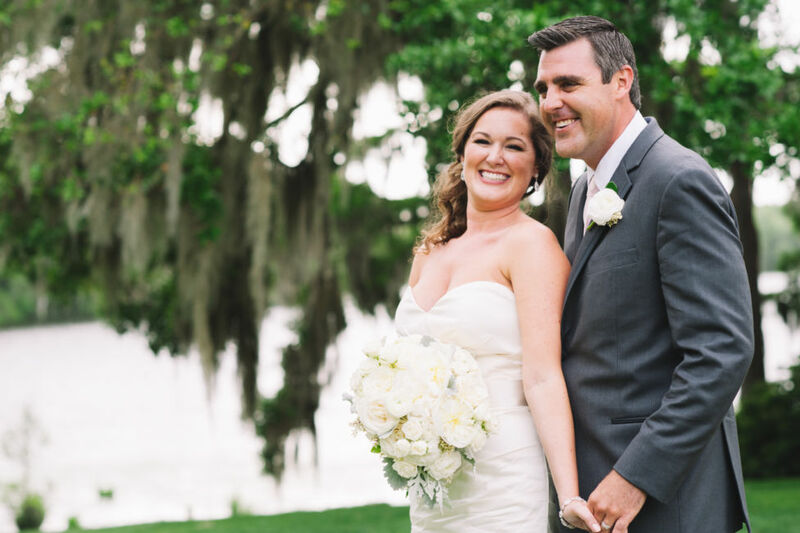 Even a 4-year, long distance relationship (Evelyn lived in Austin and Daren called Houston home) did not dampen their romance. 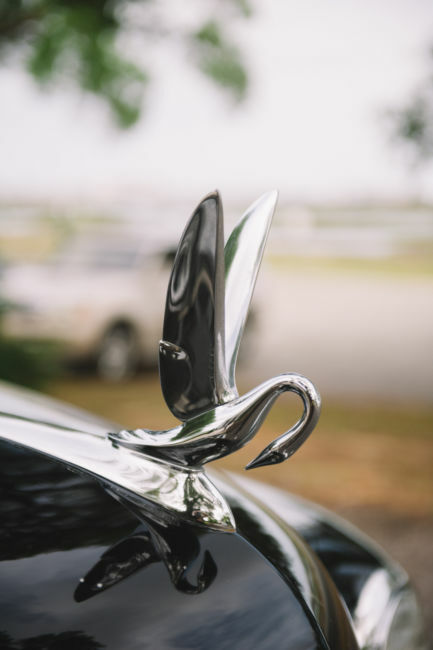 This past 4th of July holiday, Daren surprised Evelyn by showing up with his boat for a weekend full of relaxation, quality time and a special question. 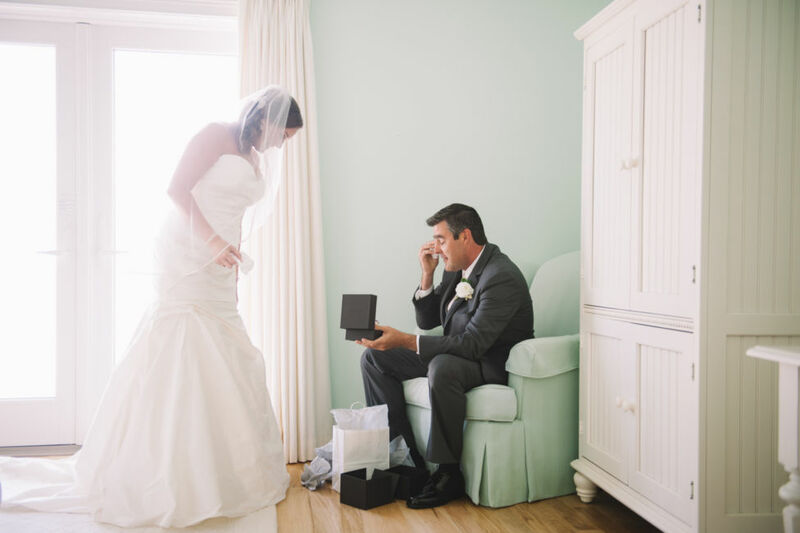 He had packed a picnic lunch, a bottle of bubbly and a small box to accompany his proposal. 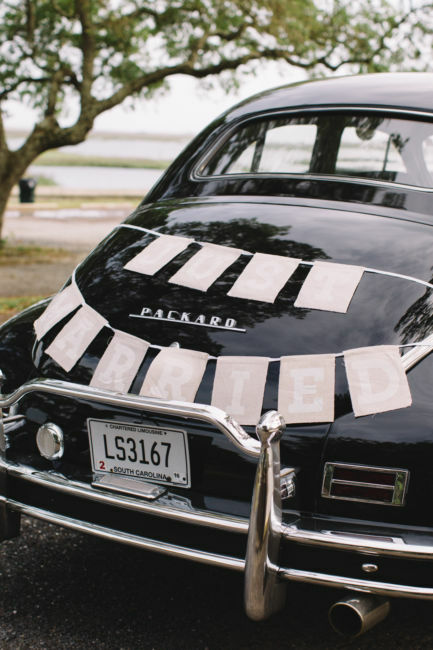 After the boat was docked, Daren popped the question to a very surprised Evelyn and the couple spent the rest of the day celebrating! 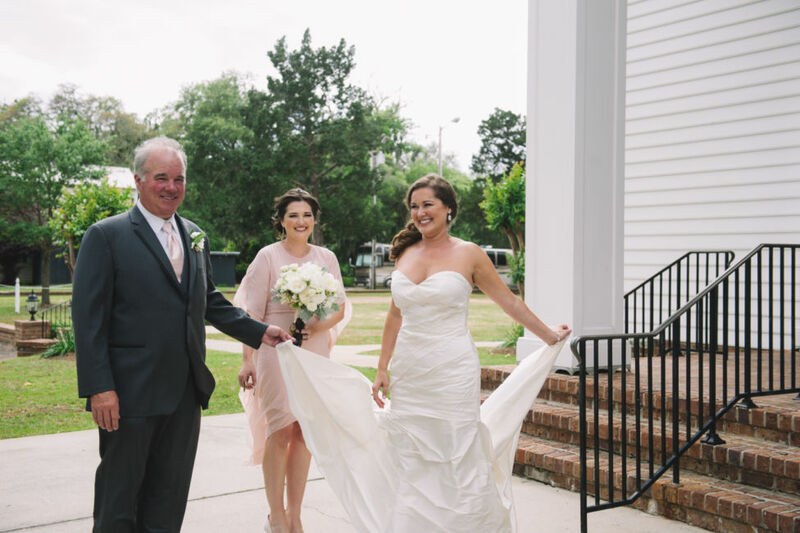 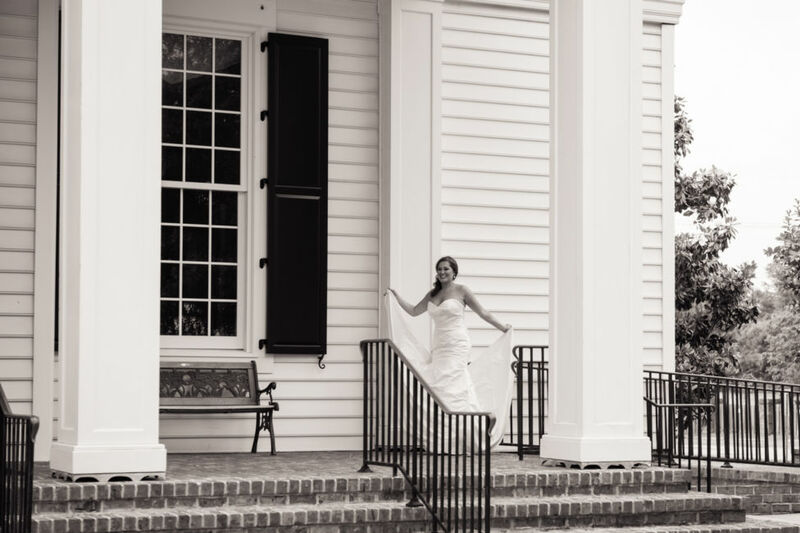 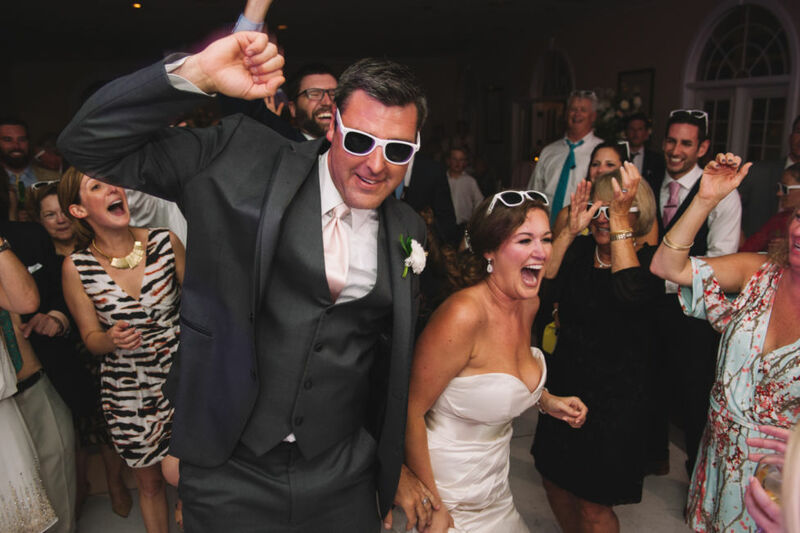 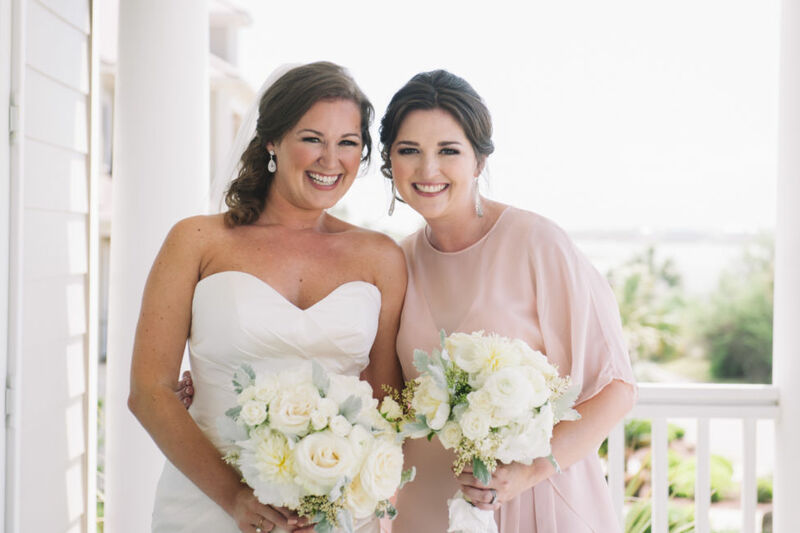 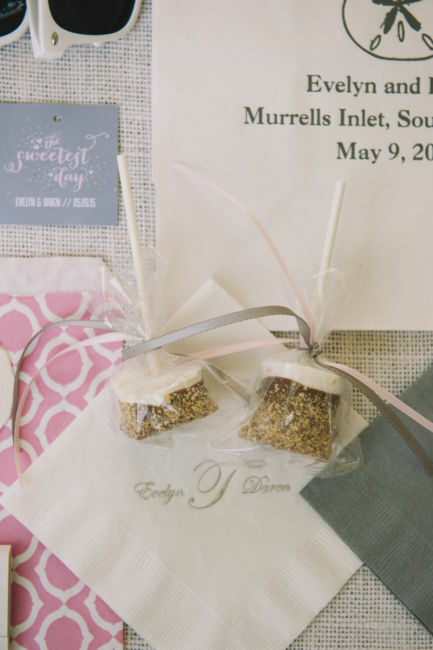 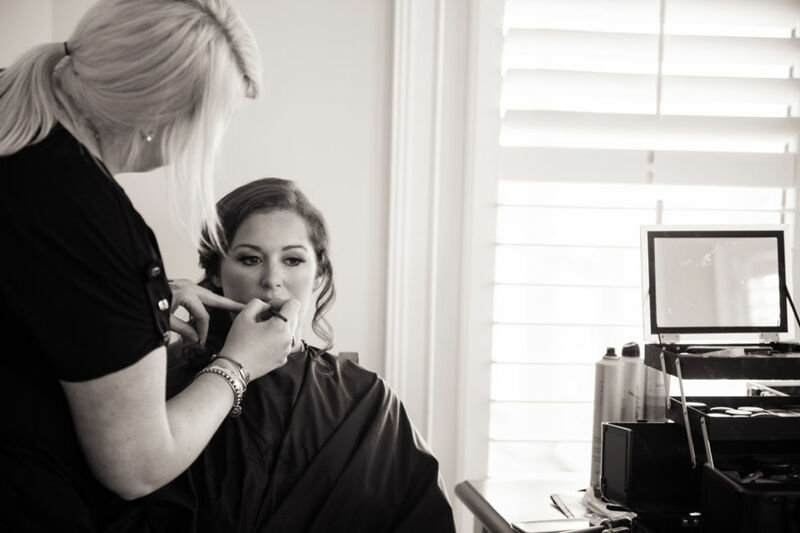 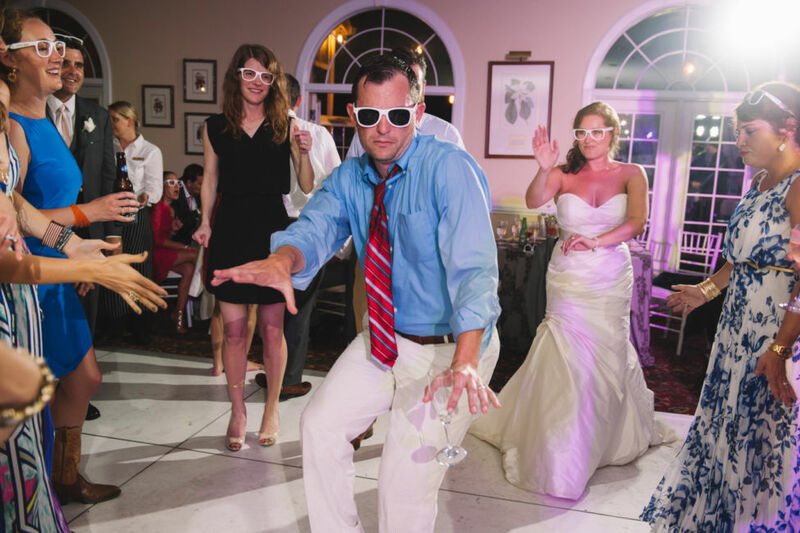 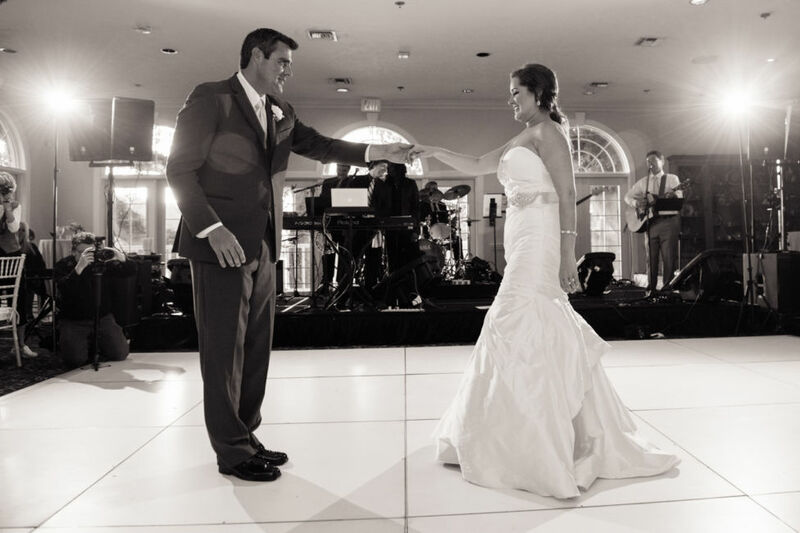 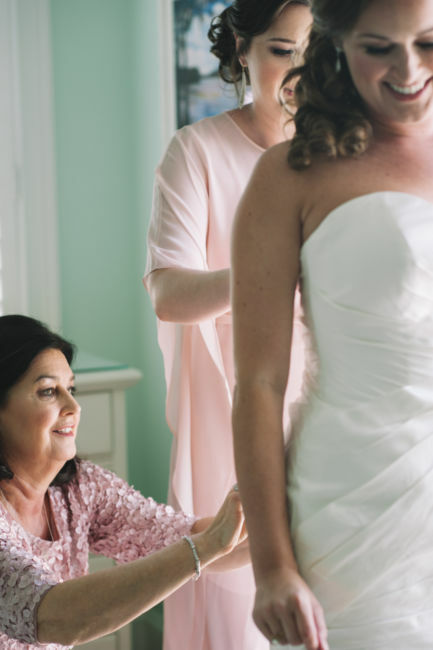 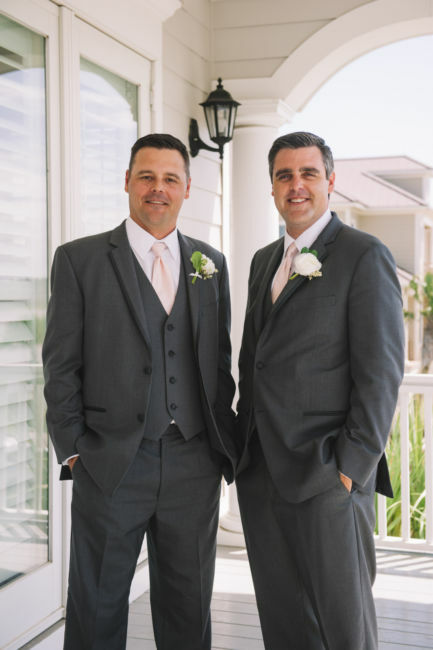 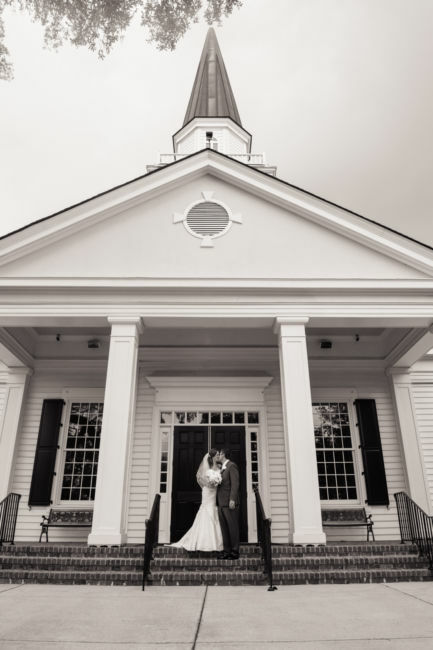 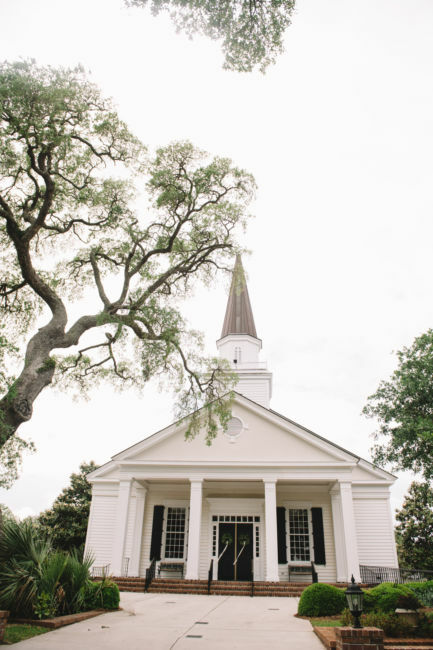 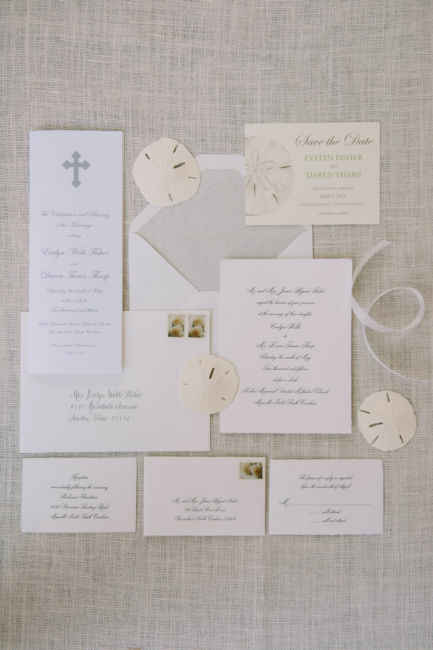 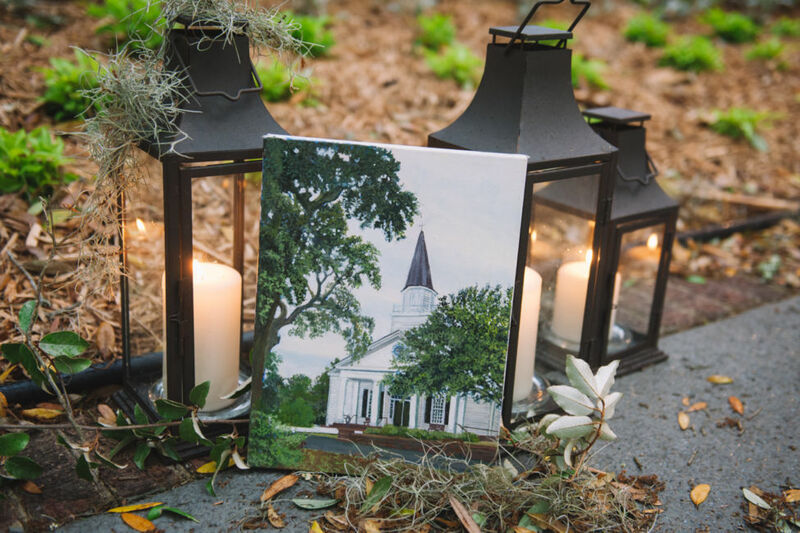 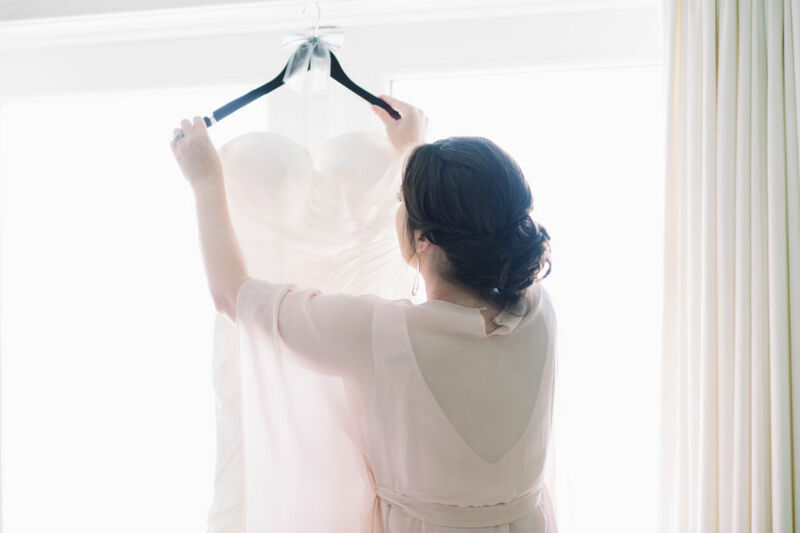 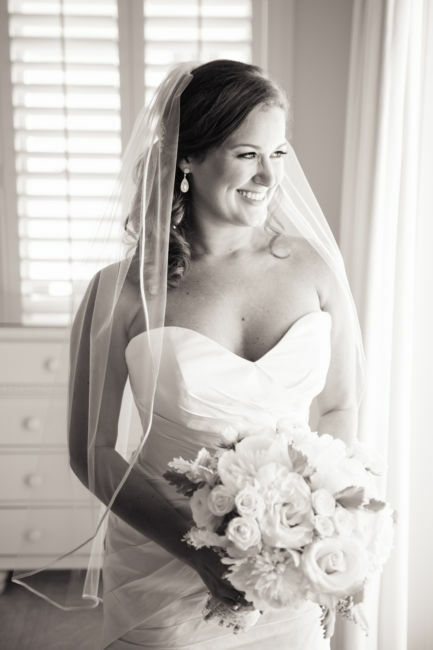 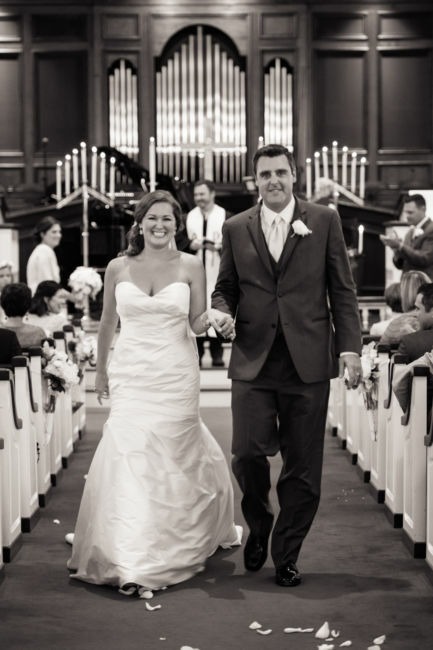 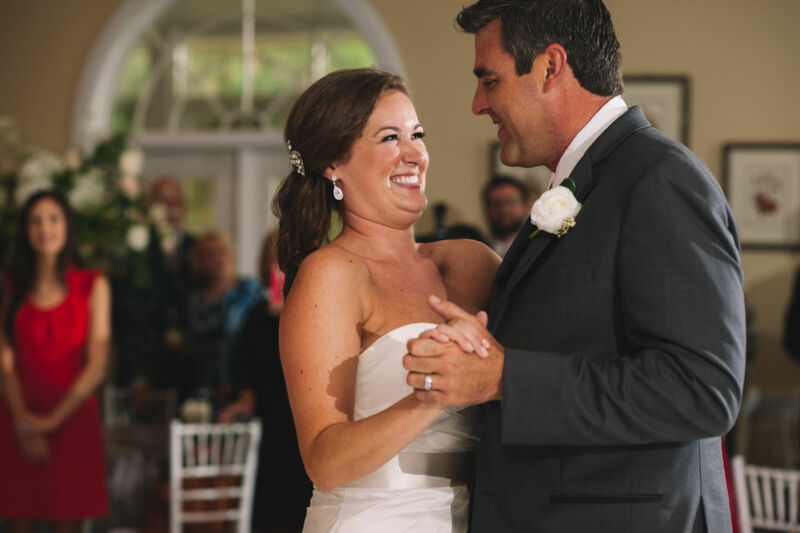 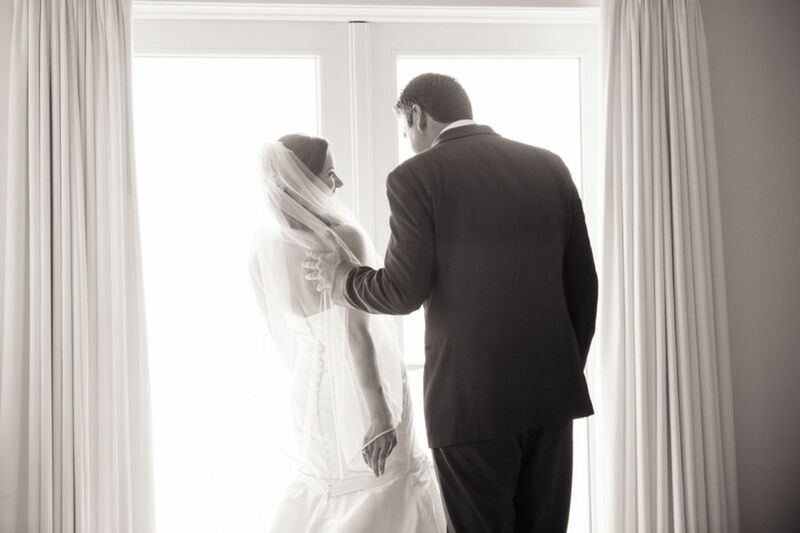 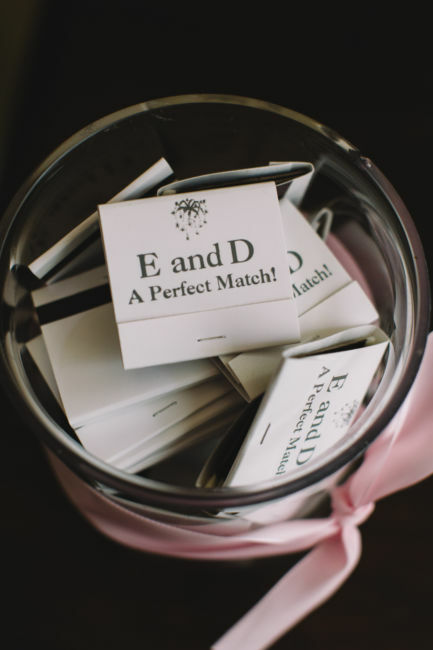 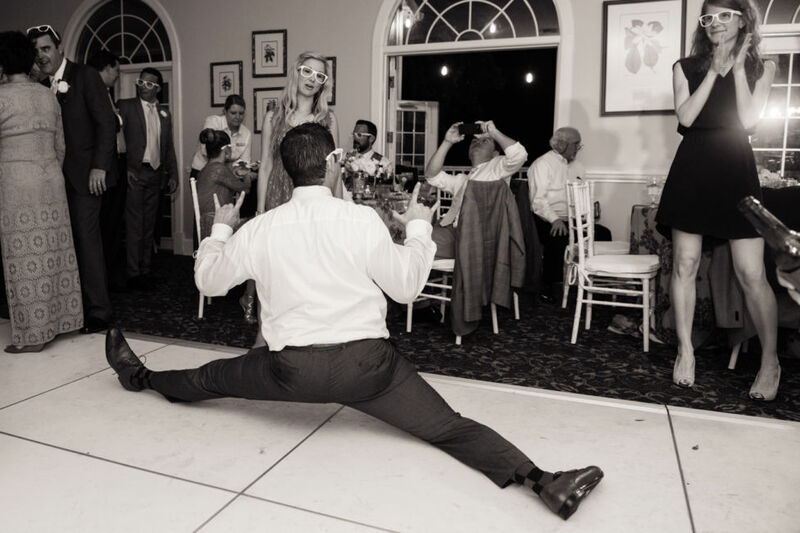 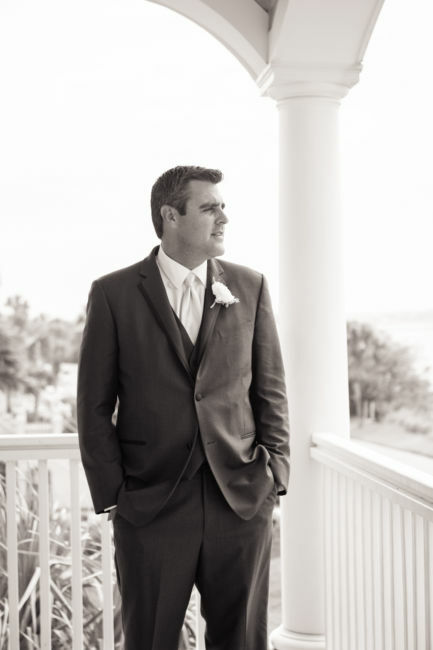 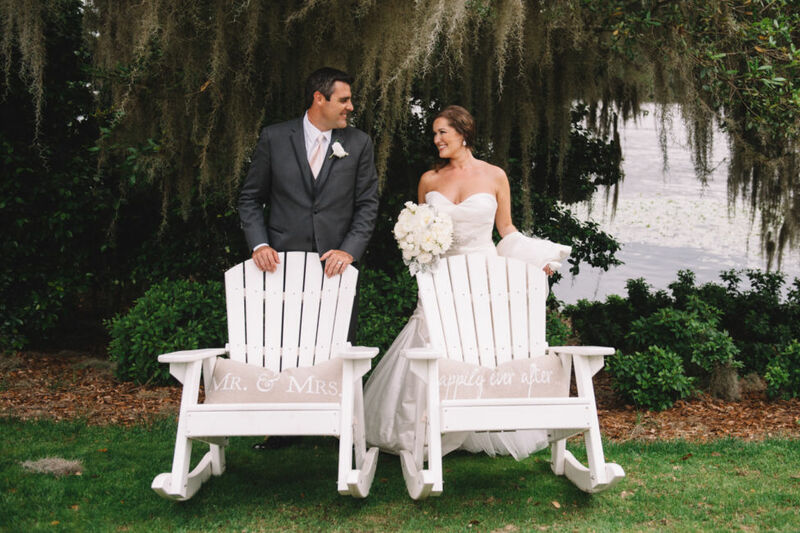 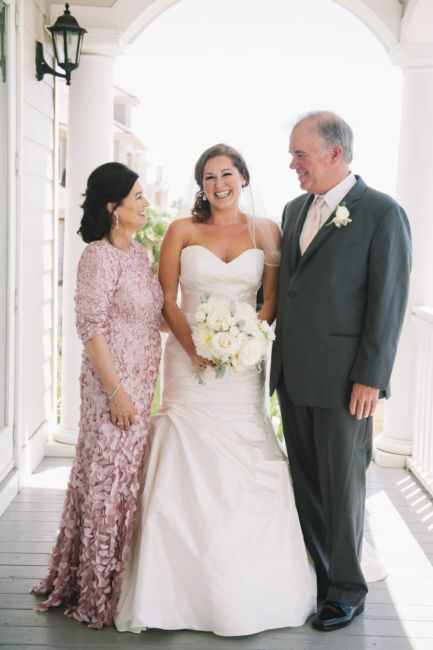 Evelyn and Daren immediately began the wedding planning: the two were to be married at Belin Memorial United Methodist Church in Murrells Inlet, SC on May 9th, 2015. 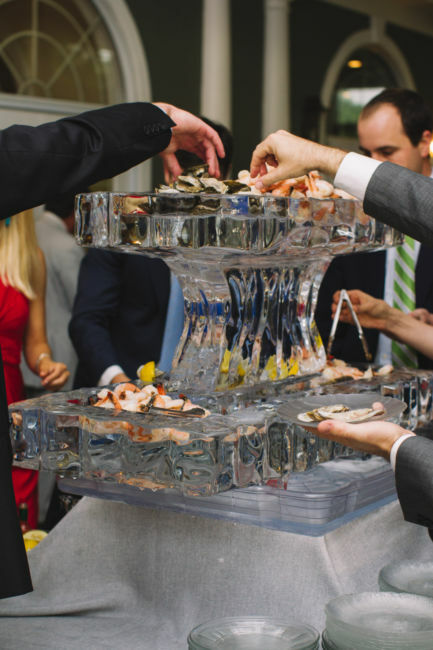 A Friday night dinner and an after party were planned partly outside. 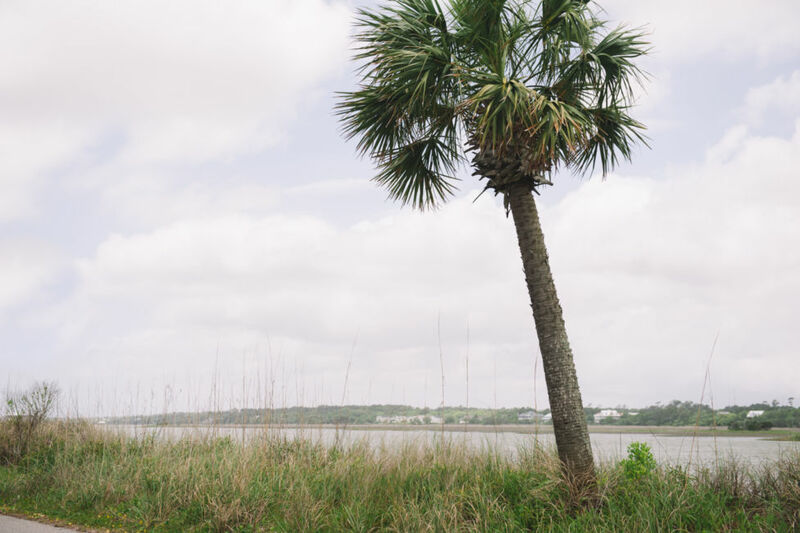 Despite weather warnings of Hurricane Ana, the entire weekend was without rain at the most important times and no damage from Ana! 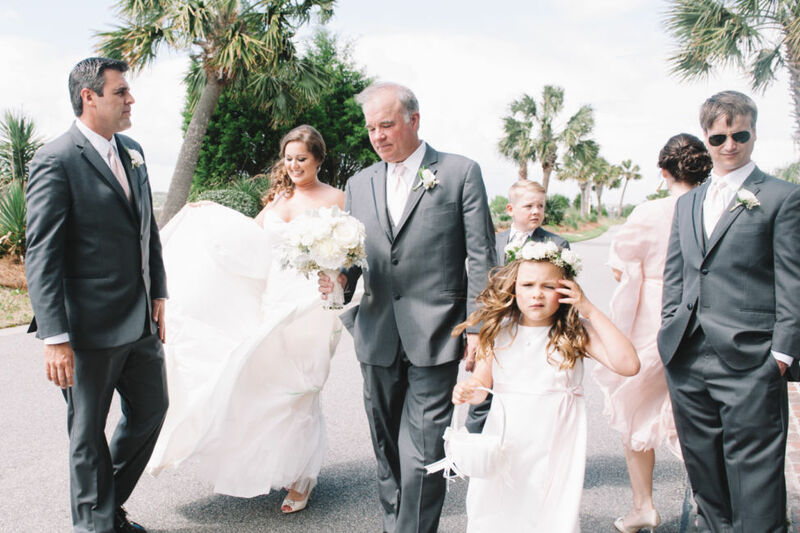 On a very breezy Saturday morning at the beach, the bride was perfecting her look with her closest family members. 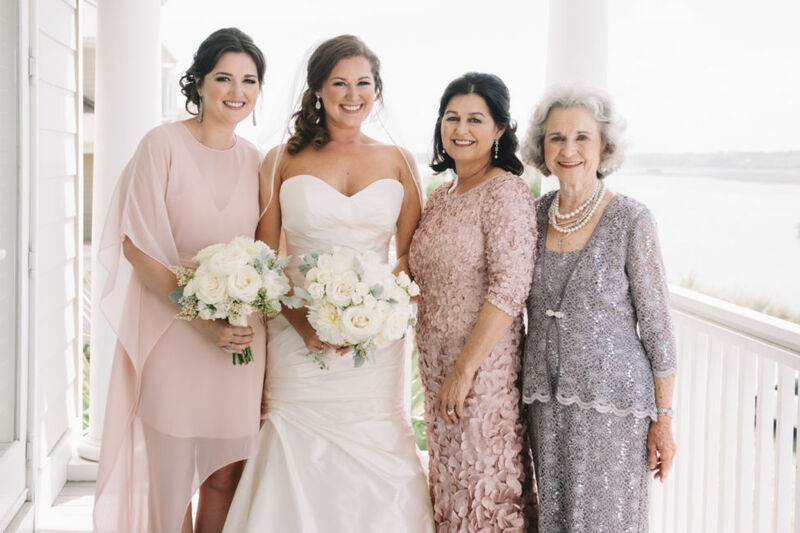 Just as her grandmother had done in years past, Evelyn’s mother had the bridal party dolls called Storybook Dolls decorating the beach home. 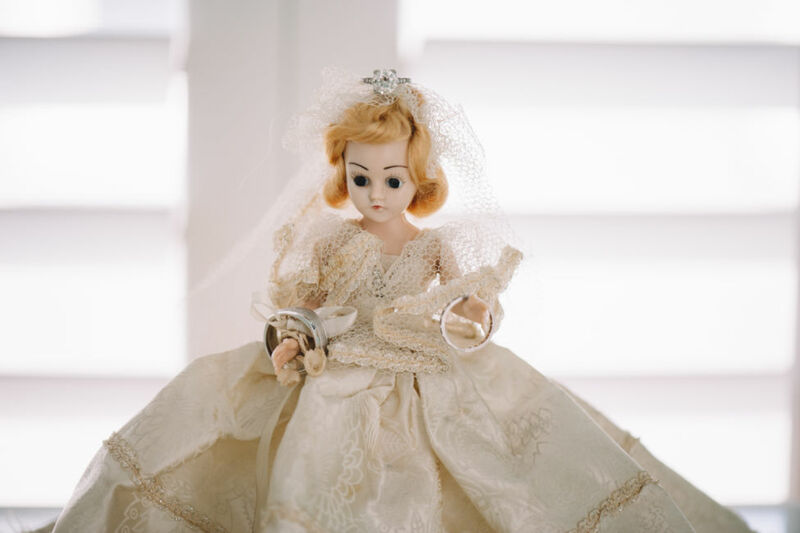 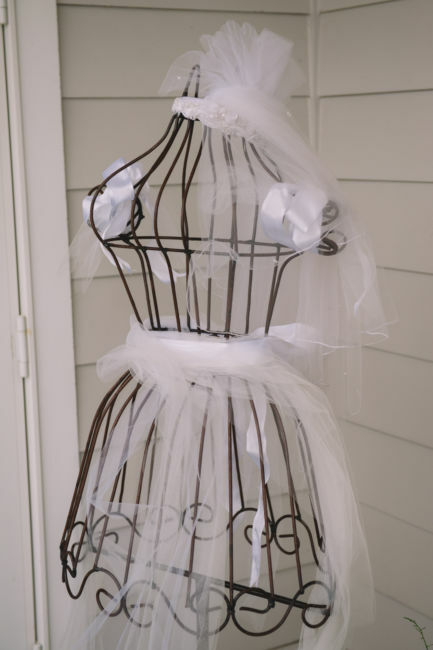 These sweet dolls have been used quite often by family and friends for bridal occasions. 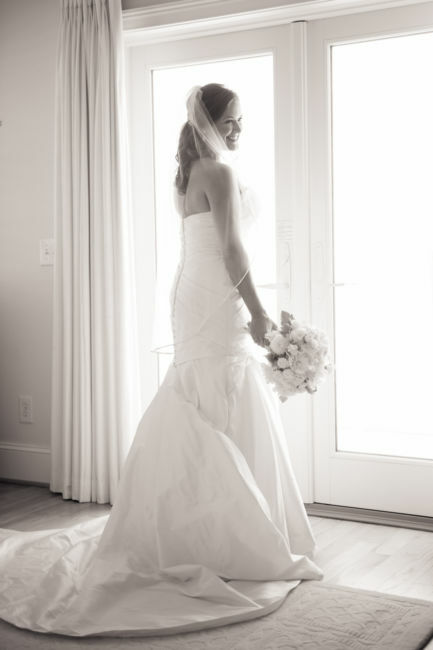 The strapless sweetheart Martina Liana gown fit Evelyn perfectly in design and attitude – classic and timeless for a beautiful, young woman. 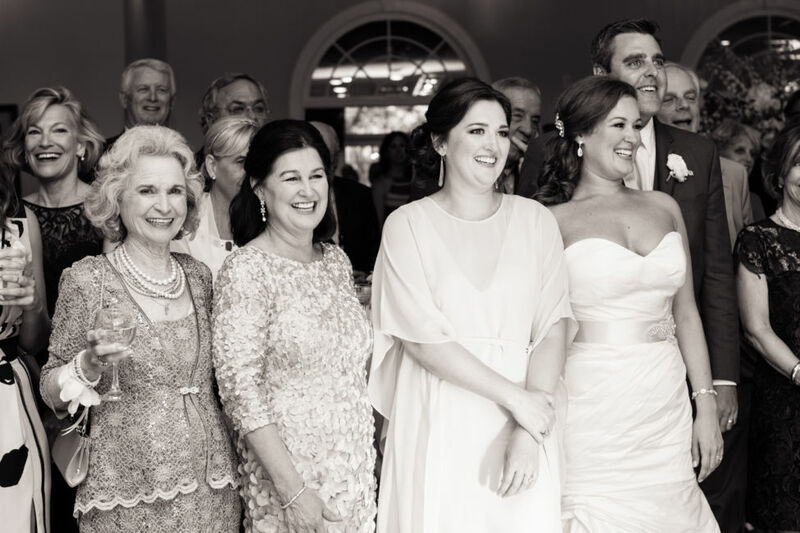 I loved the picture of these four elegant, southern women, Dede, Evelyn, Evelyn and Grandolly on Mother’s Day weekend! 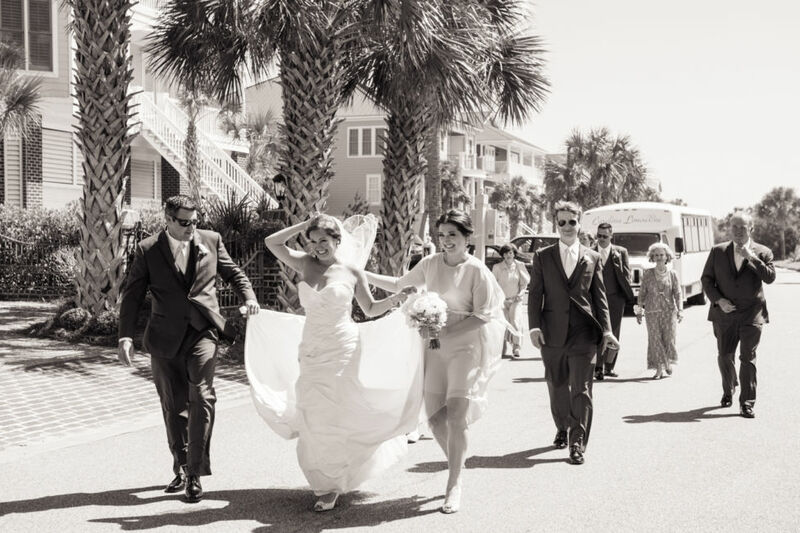 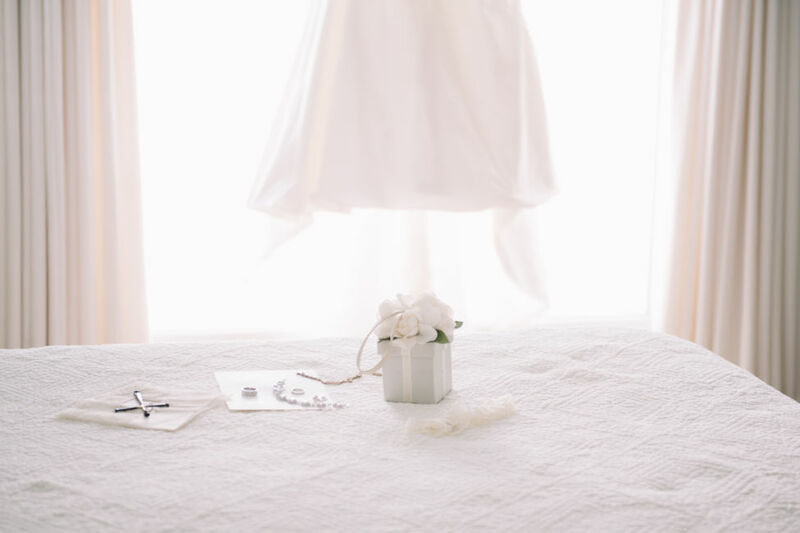 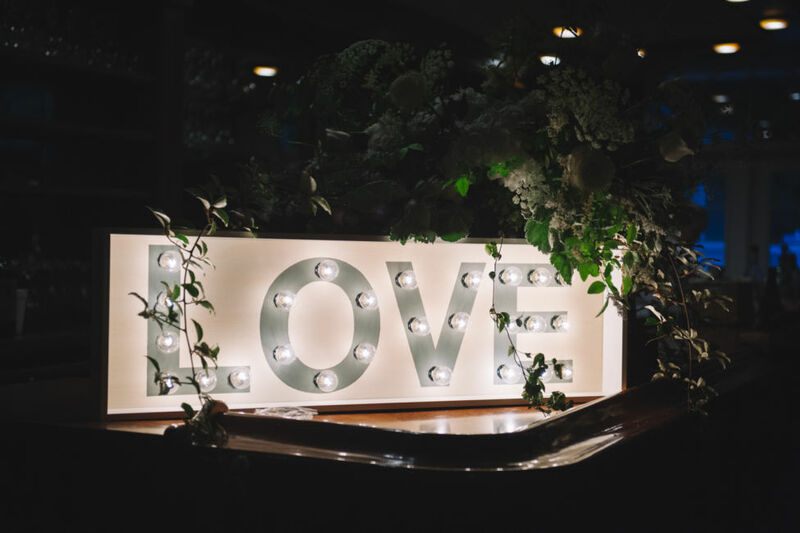 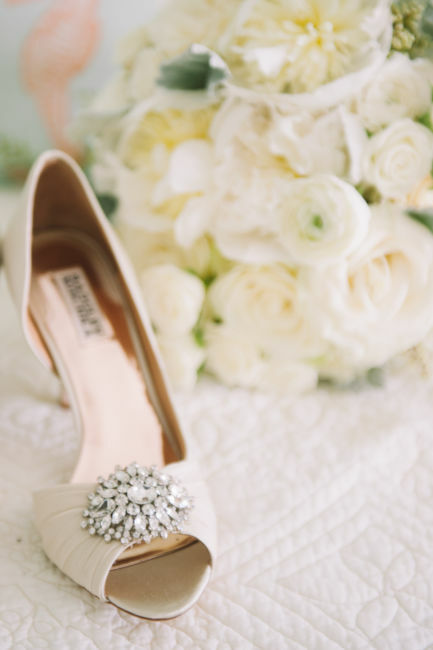 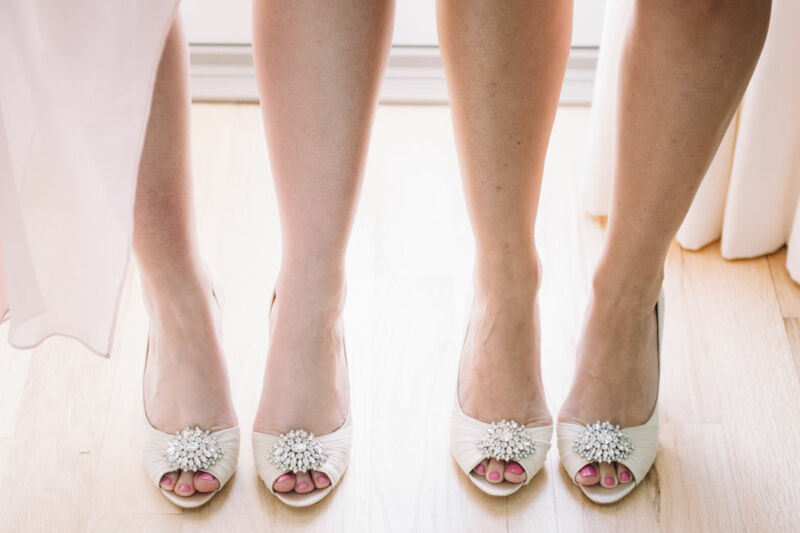 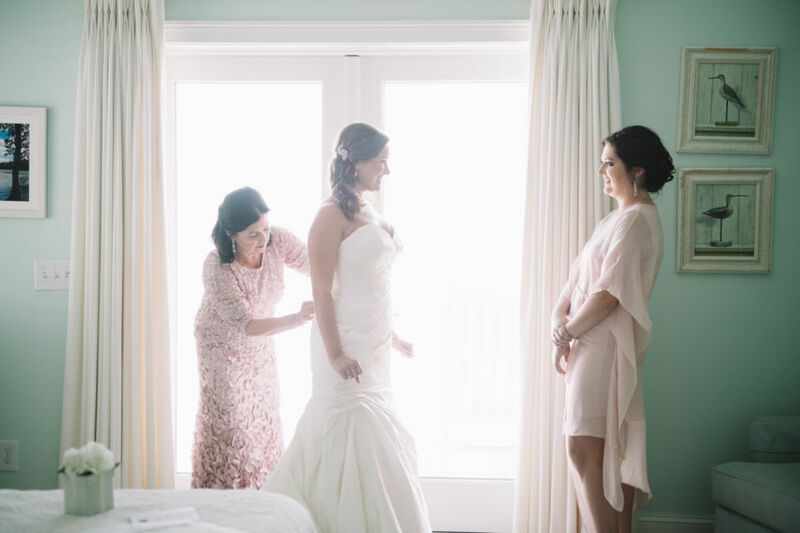 The familiar saying, “Something old, Something New, Something Borrowed, Something Blue, And a Sixpence in her shoe” has set forth traditions over the ages and was well carried out by the family. 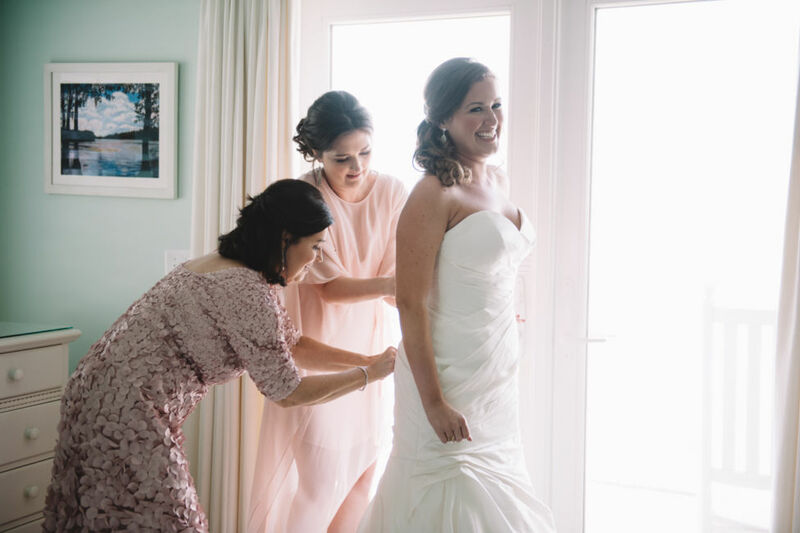 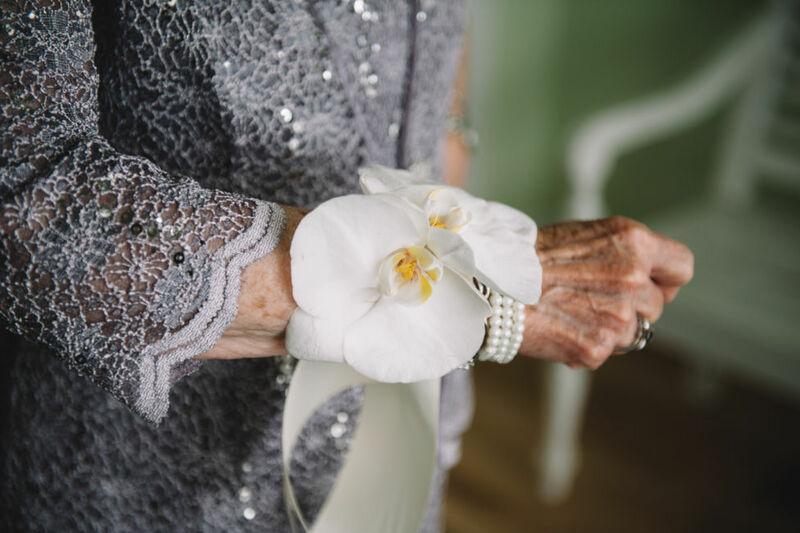 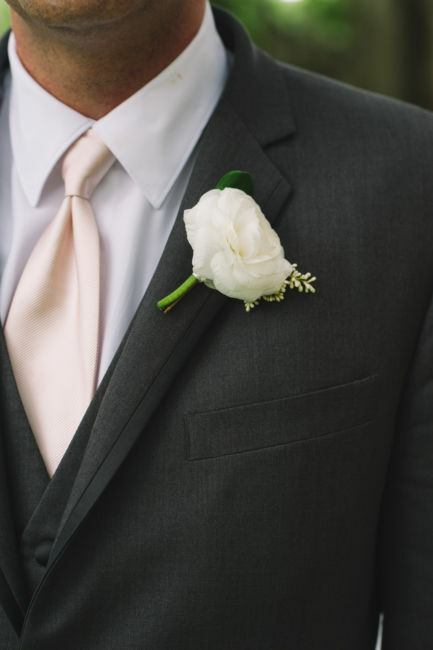 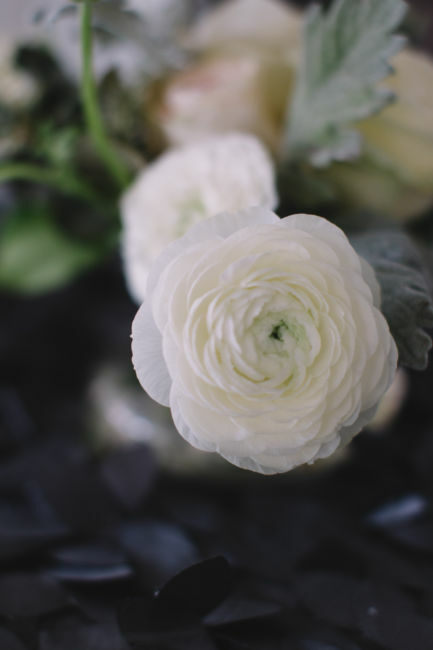 Enclosing the stems of Evelyn’s bouquet was the “Something old”: a French rolled and embroidered lace handkerchief sewn by her great grandmother Evelyn (The bride, the mother of the bride and the great-grandmother of the bride are all Evelyns!). 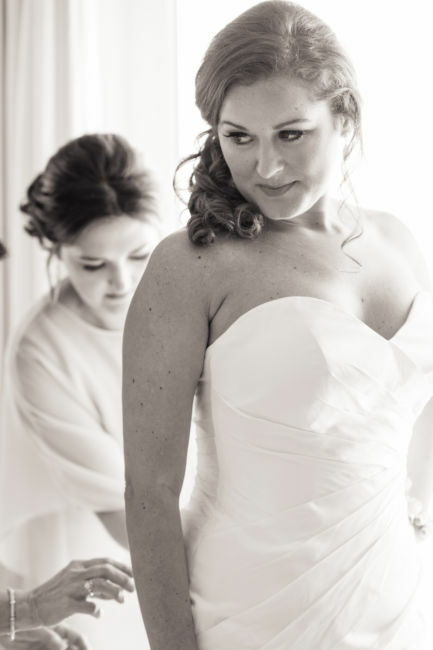 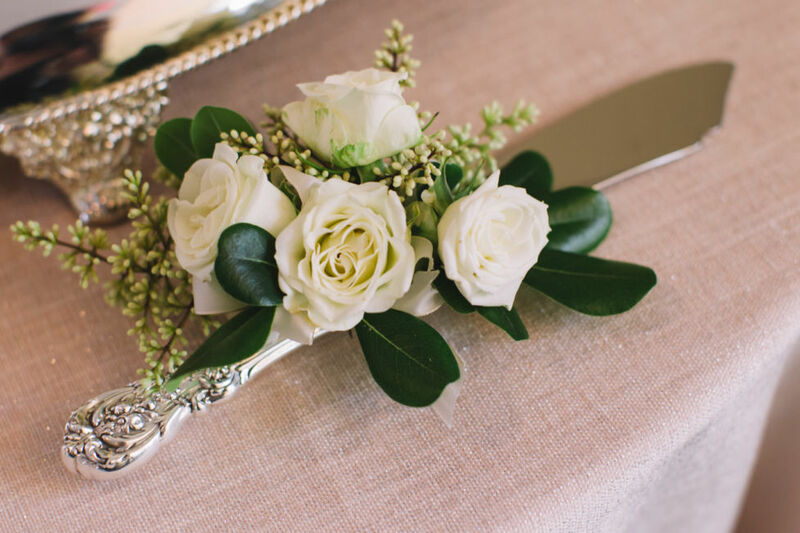 ‘Something borrowed’ was the unique comb worn in Evelyn’s hair – which her sister had also worn on her wedding day. 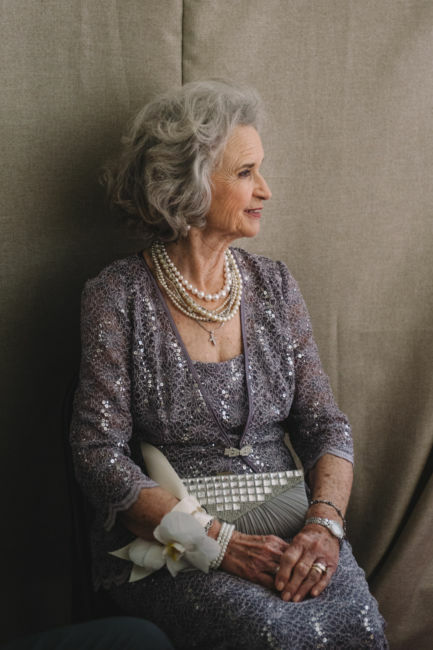 A 16th birthday gift to mom Evelyn by her parents, was passed on to our bride Evelyn on her 16th birthday: the ‘Something blue’ – a gorgeous pearl and sapphire ring. 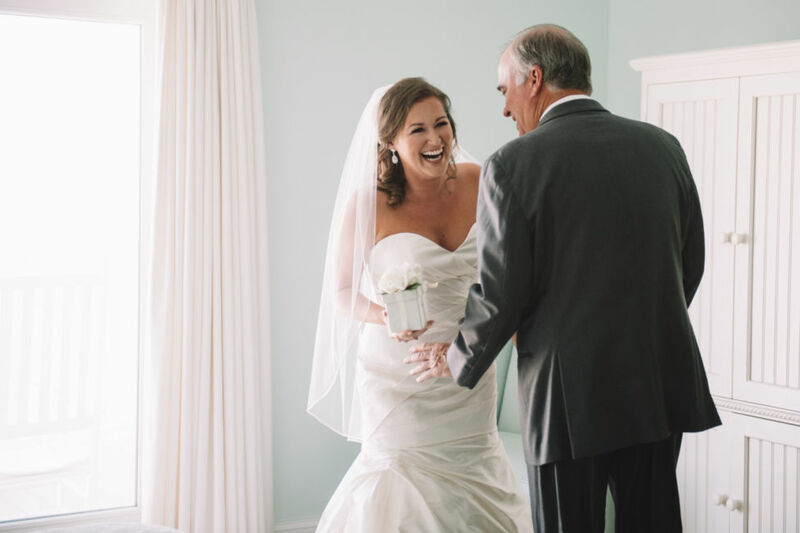 Then the father of the bride placed inside Evelyn’s left shoe the sixpence to wish her all the blessings a father can give to his daughter. 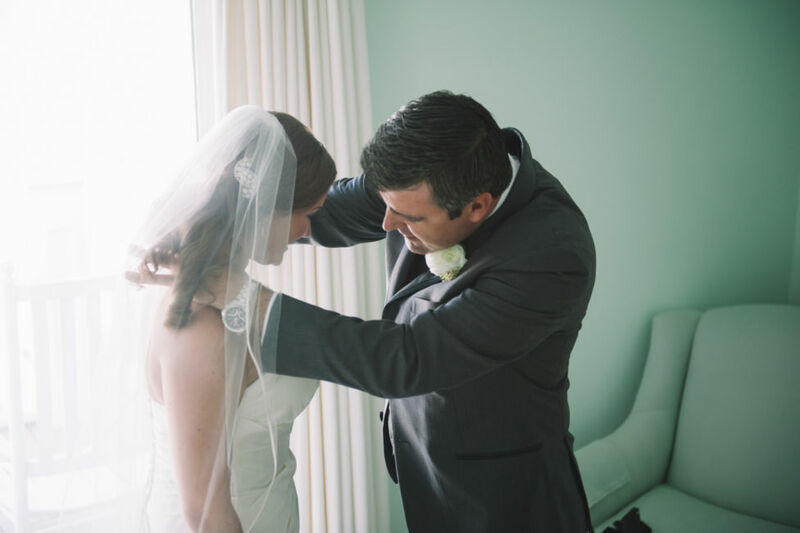 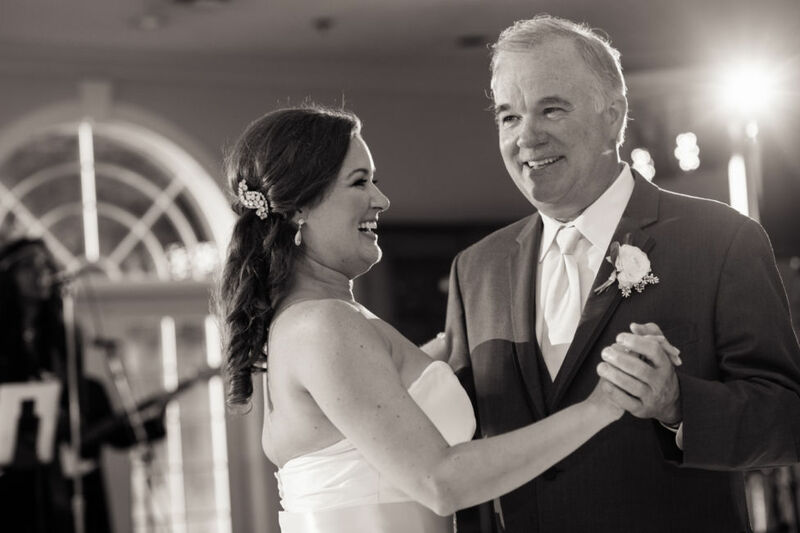 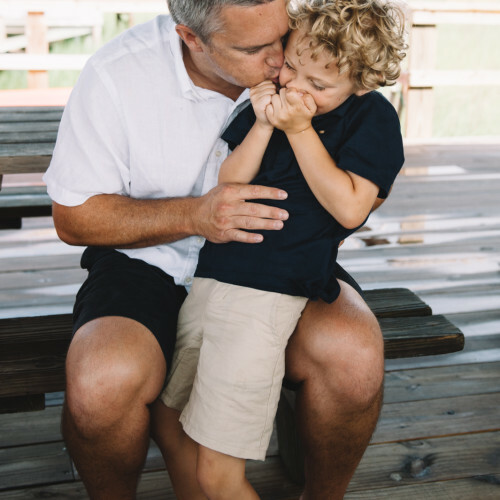 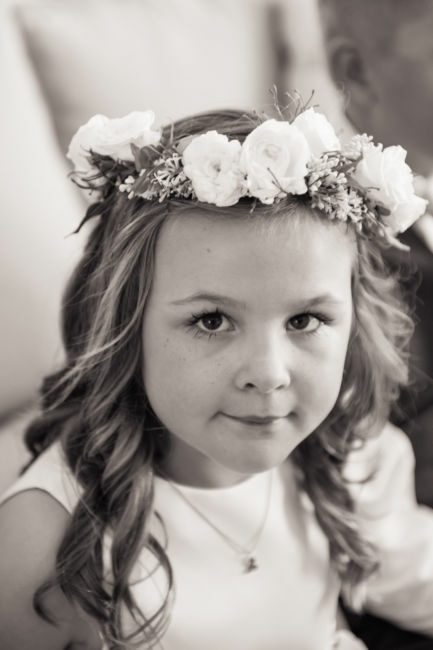 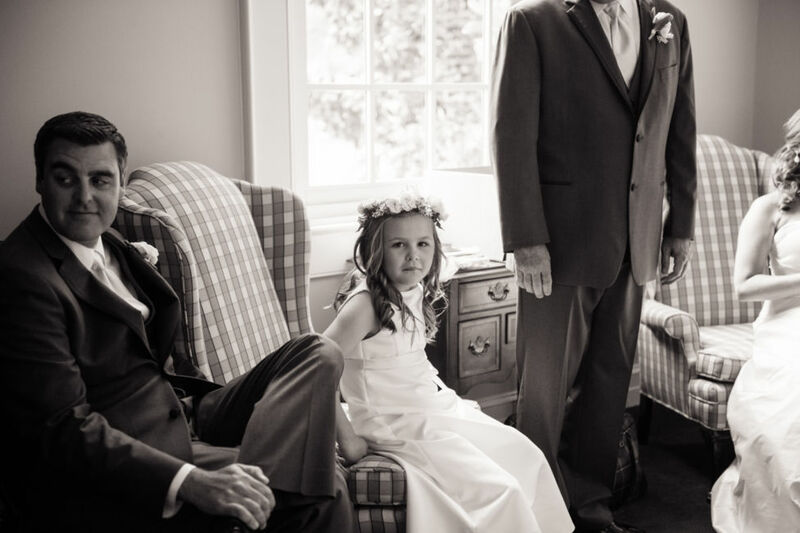 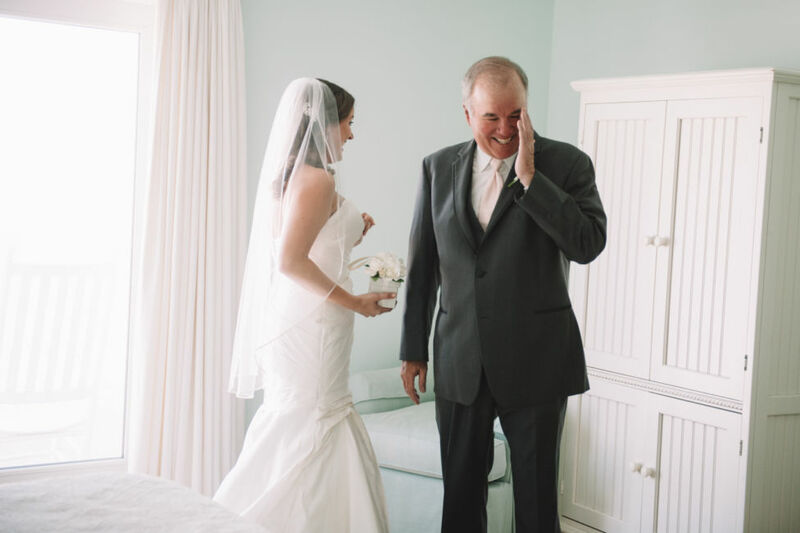 Tender, sweet moments were shared by Evelyn and her dad with a few tears. 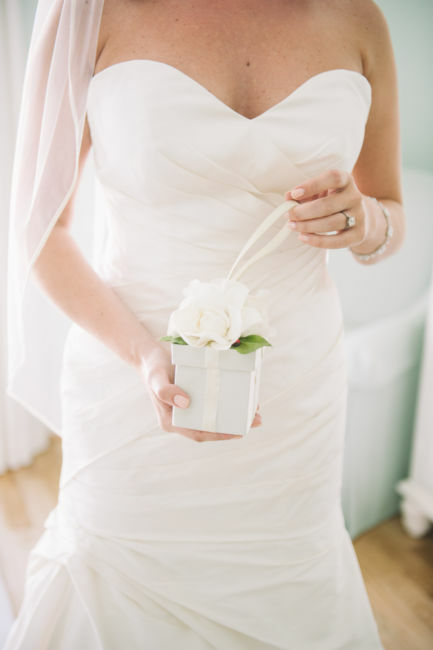 The flowered box purse Evelyn carried was handmade for her by her godmother when Evelyn made her debut into society. 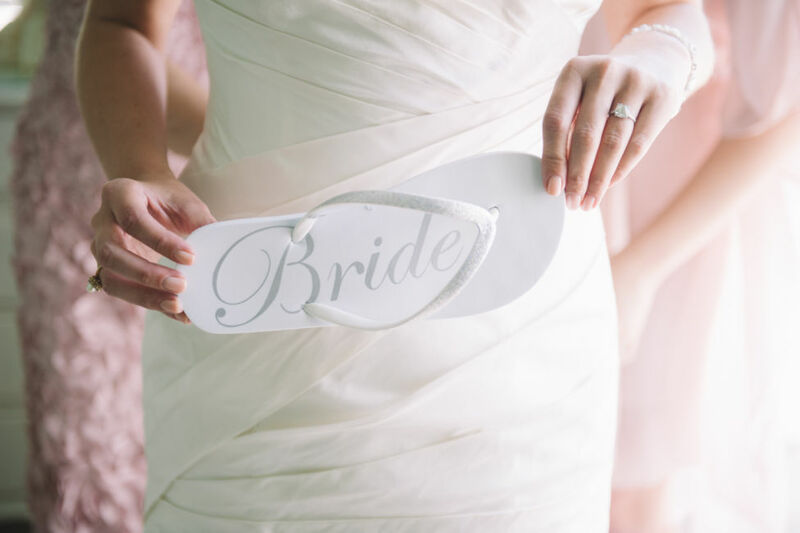 Evelyn cherished this keepsake and used this purse on her wedding day. 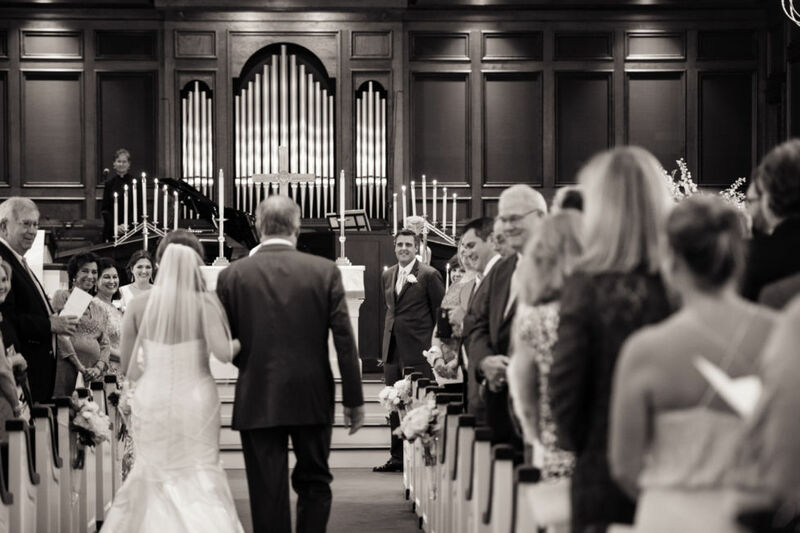 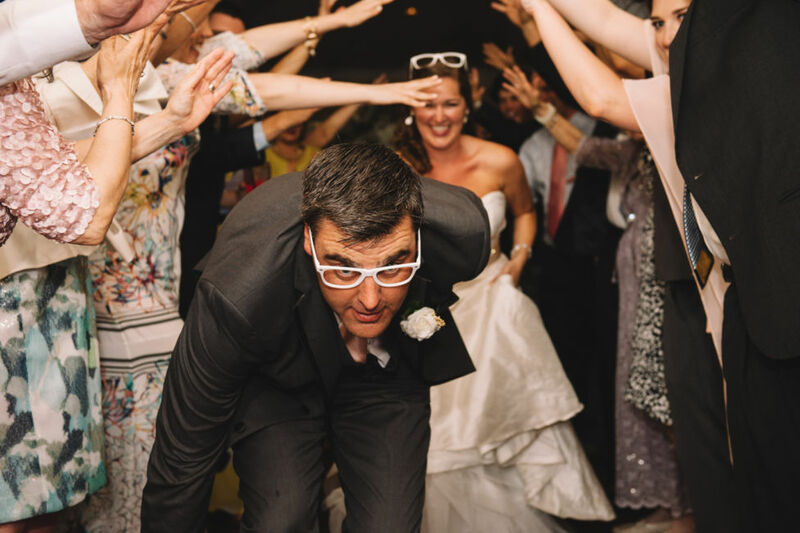 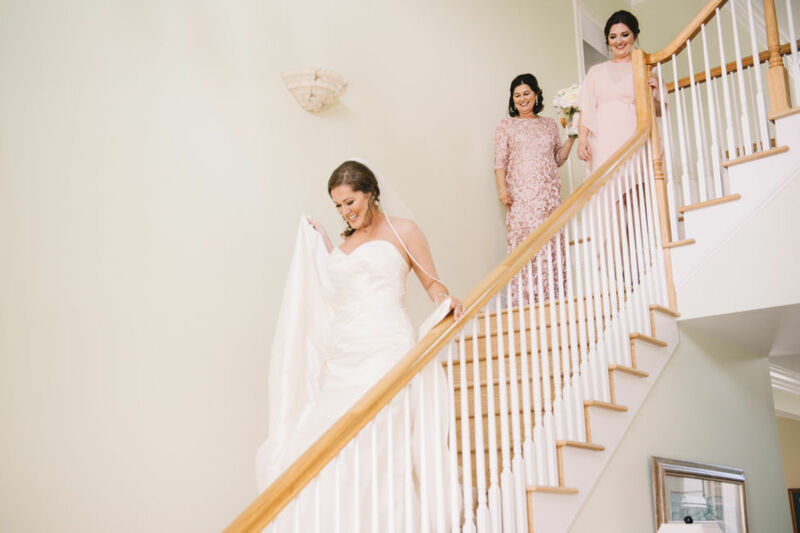 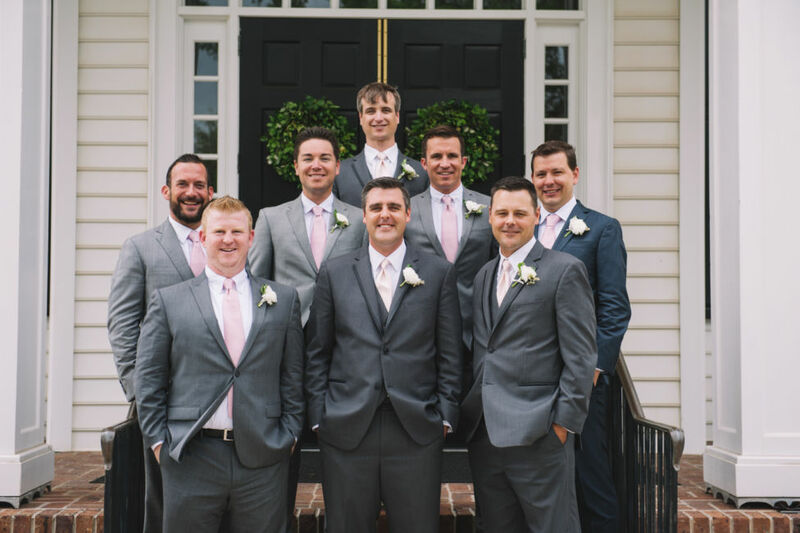 Although Evelyn and Daren chose not to have attendants, except sister Dede for Evelyn and brother Cody for Daren, the guests were ushered to their seats in the historic church by very handsome, close family friends of Daren. 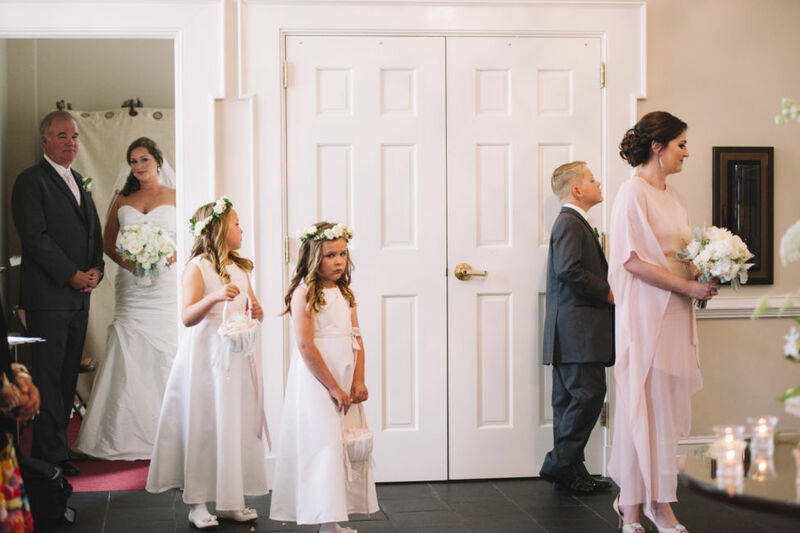 The flower girls and ring bearer were Daren’s nieces and nephew. 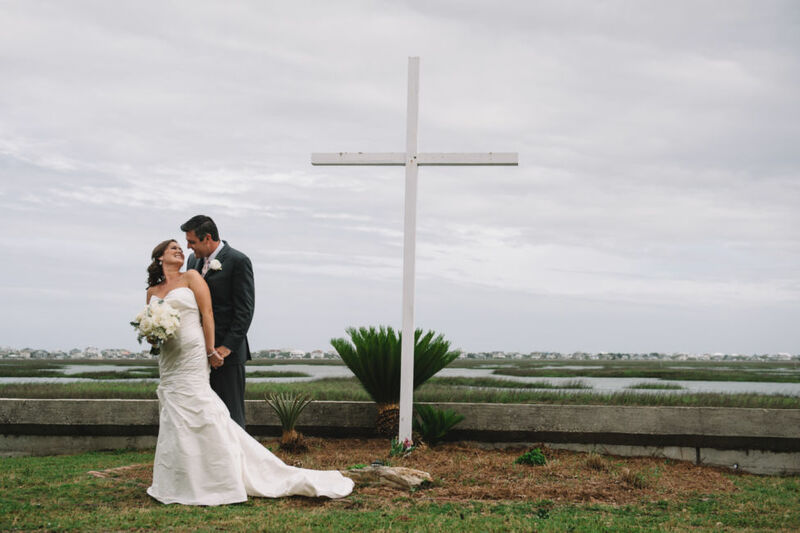 Even with Hurricane Ana threatening, Daren and Evelyn stood before the seawall cross in front of the scenic inlet whose waters the church faced. 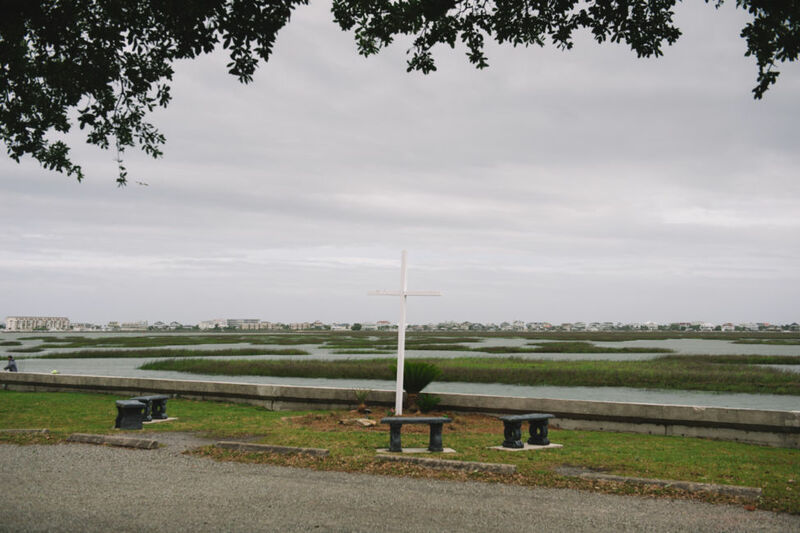 The cross is the site of outdoor worship at the blessing of the Inlet (Murrells Inlet) each May. 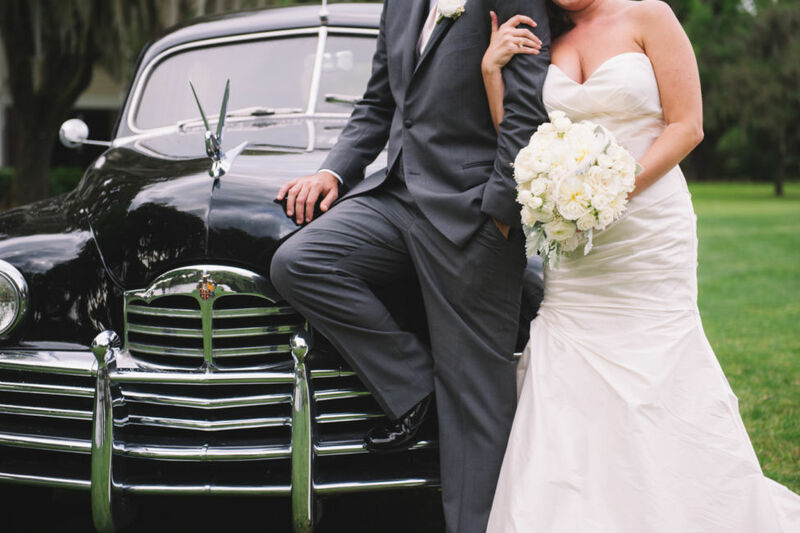 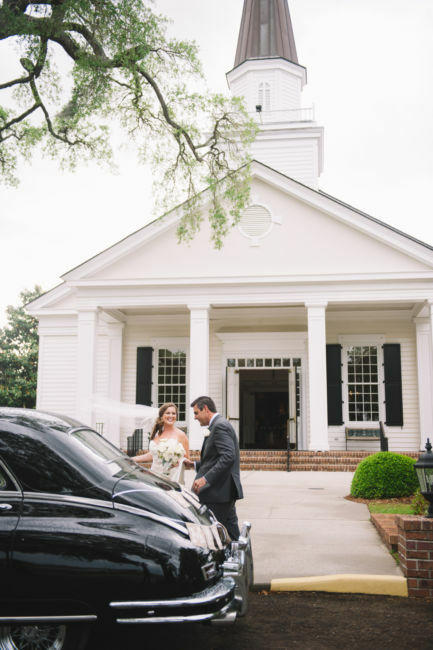 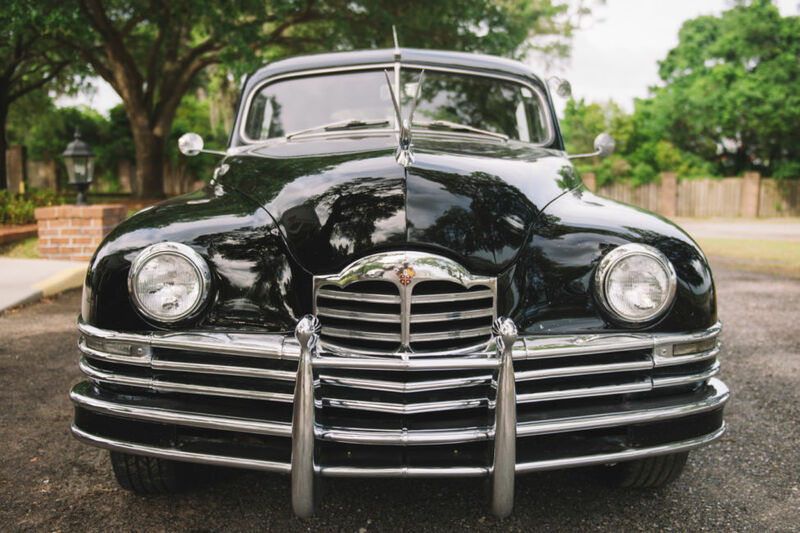 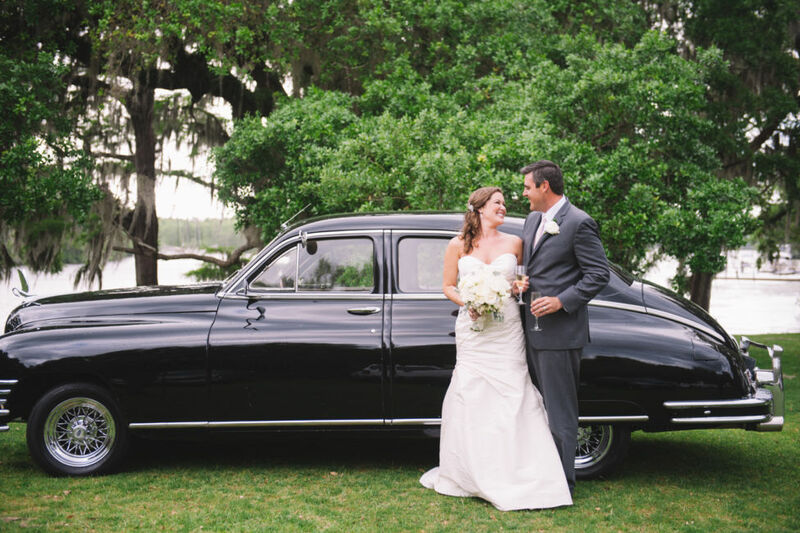 A sophisticated Packard car awaited their exit from the church to take them to the reception at Kimbels of Wachesaw Plantation. 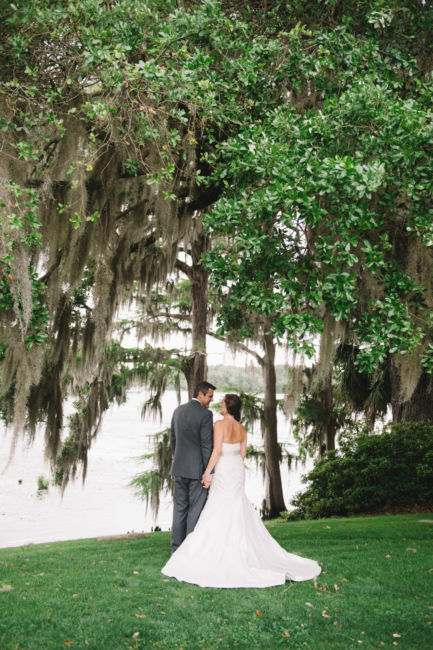 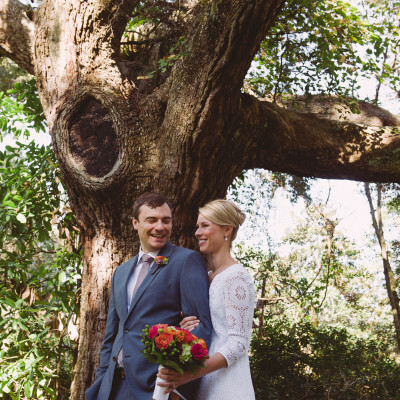 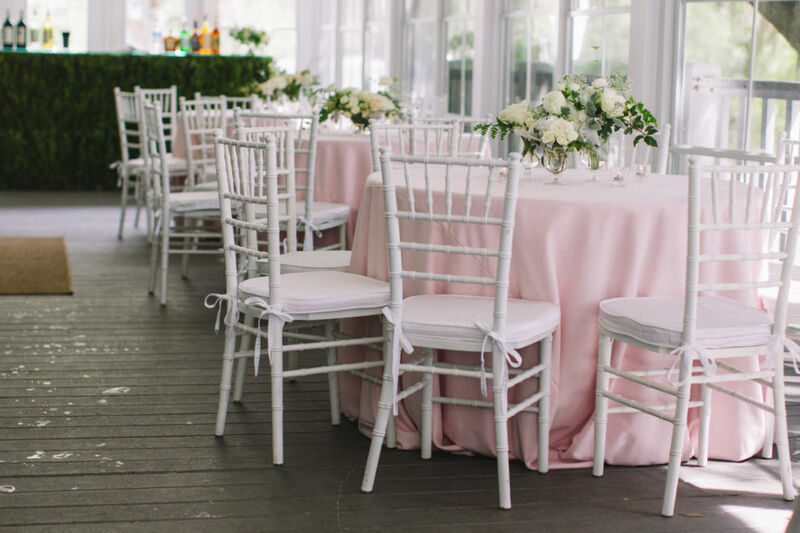 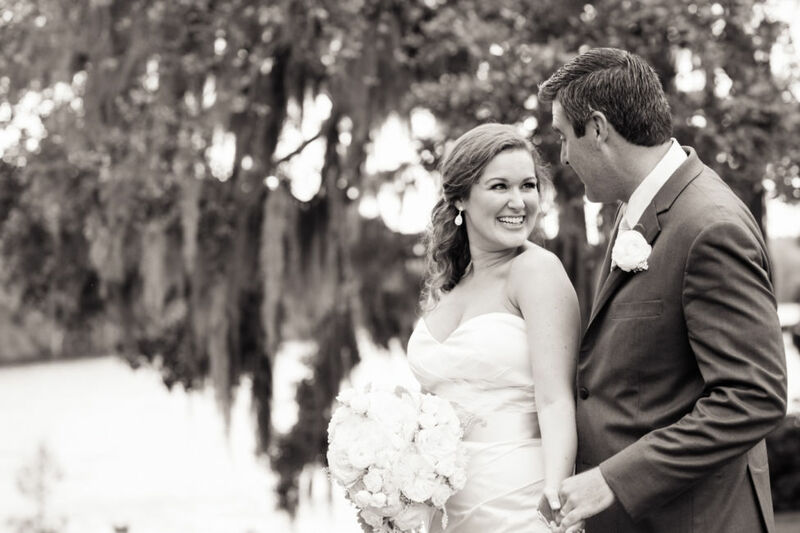 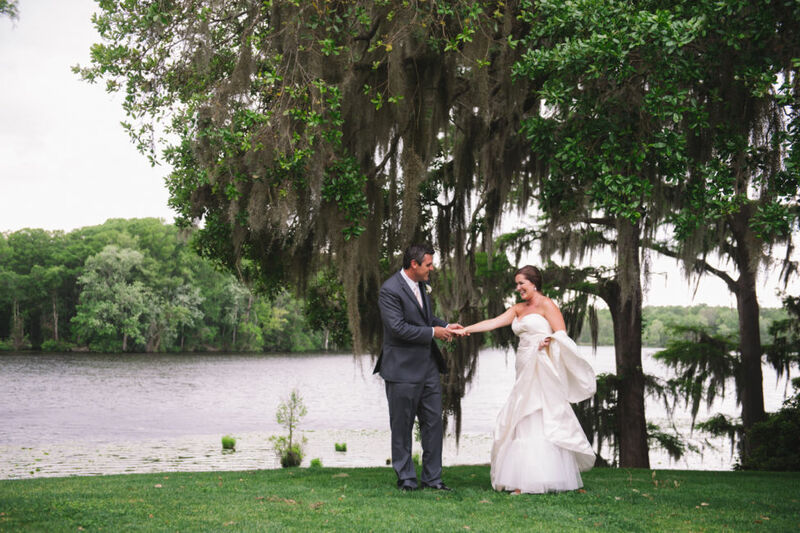 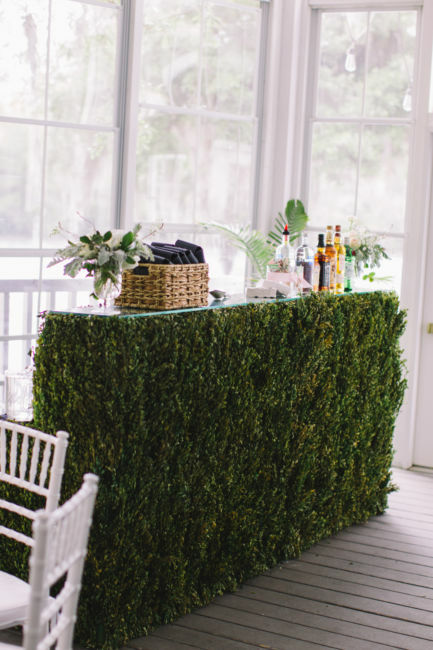 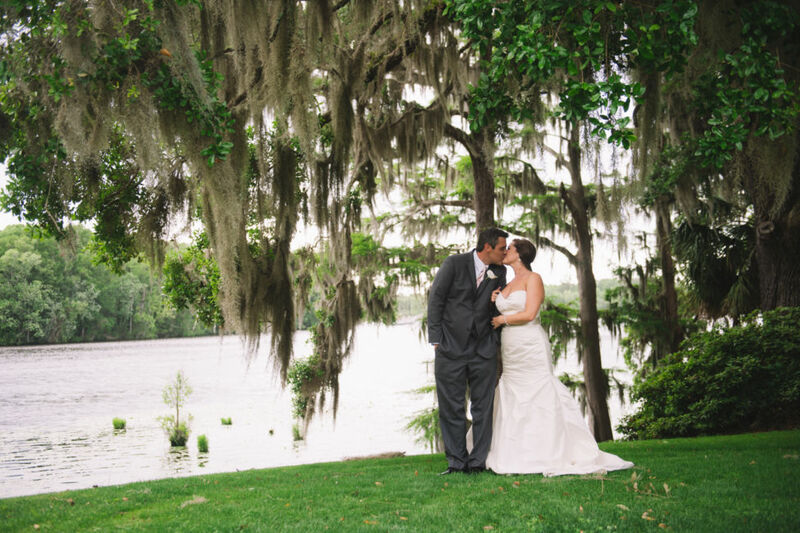 The guests enjoyed a cocktail hour with acoustic guitar, delightful passed hors d’oeuvres and the scenery of the live oaks and Spanish moss. 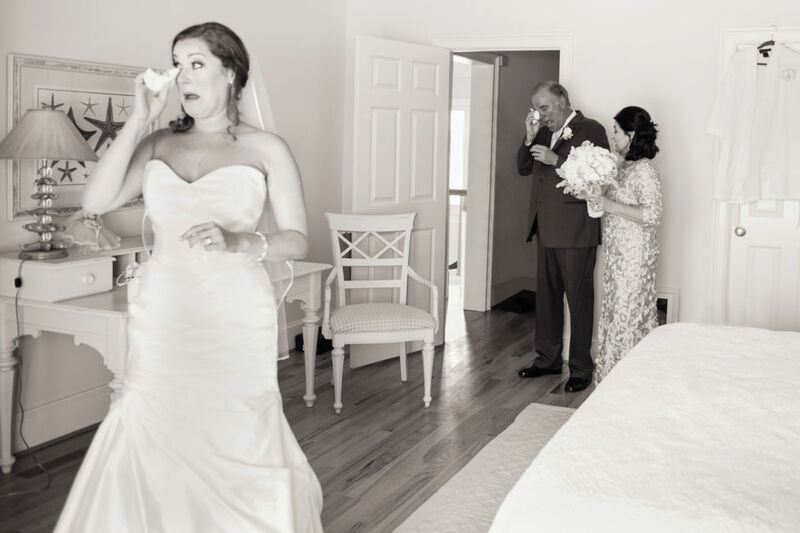 The families had wedding pictures displayed from several generations along with wedding cake toppers the bride’s mother has collected for years. 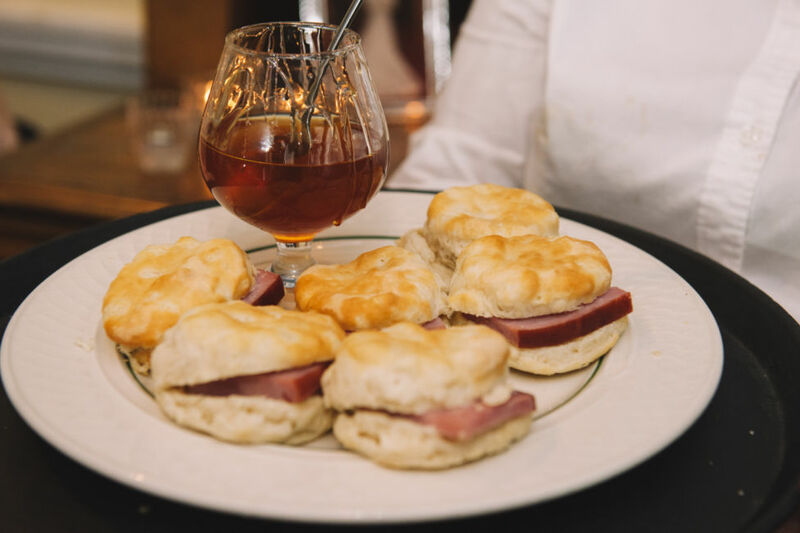 At dinner the southern fare did not disappoint – including shrimp and grits. 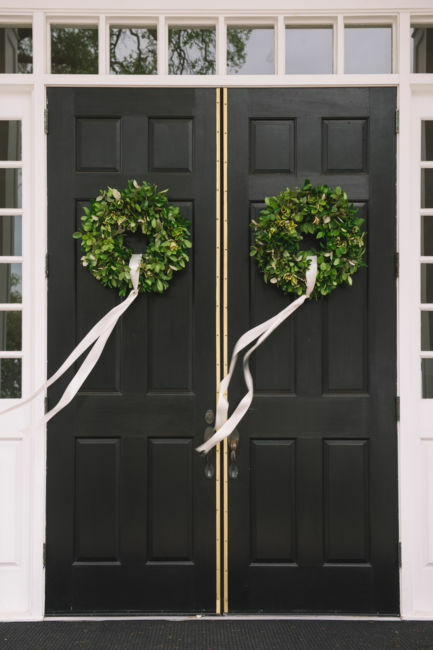 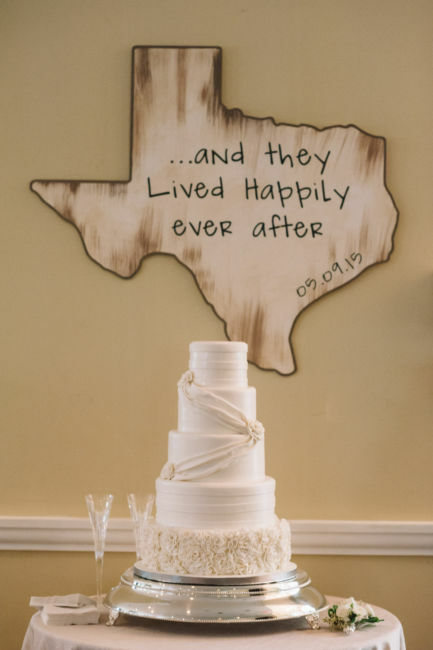 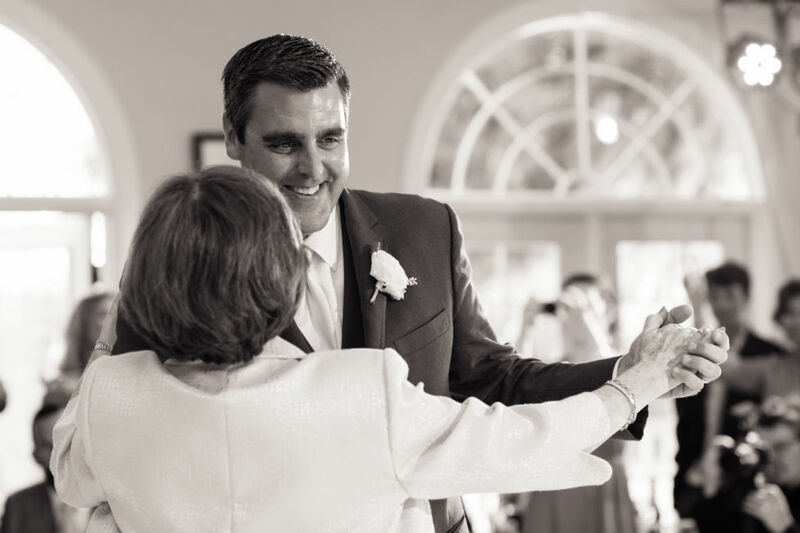 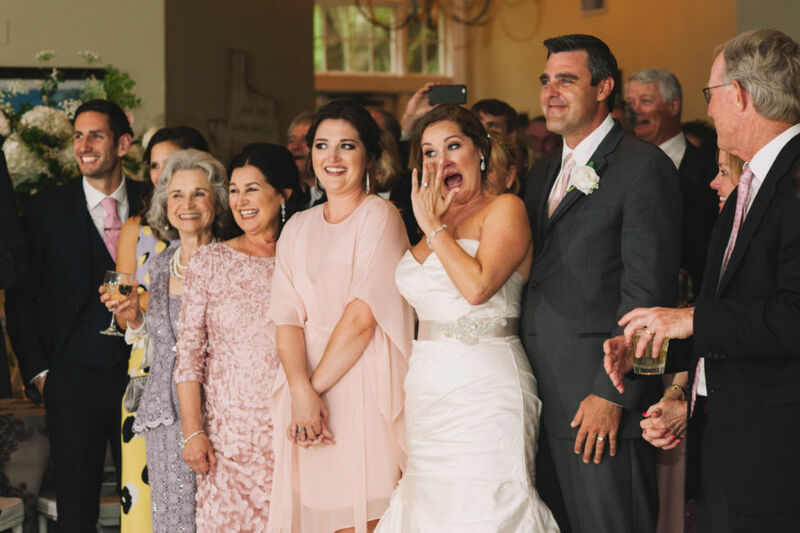 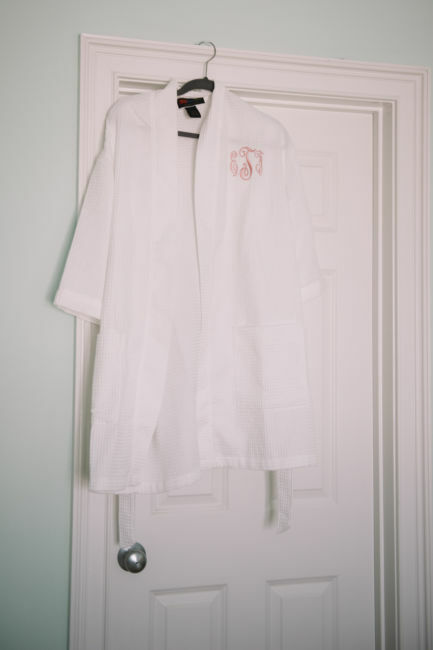 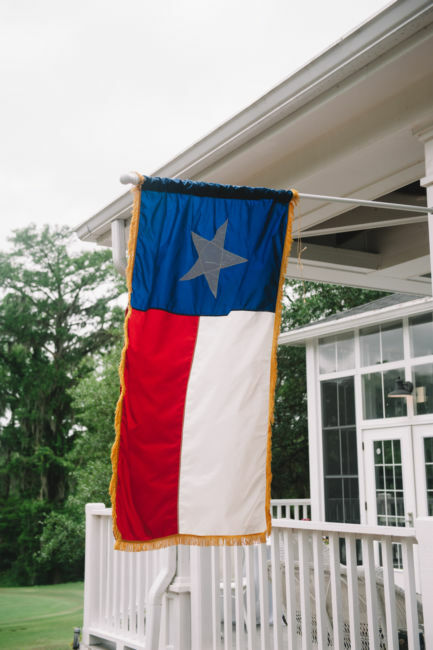 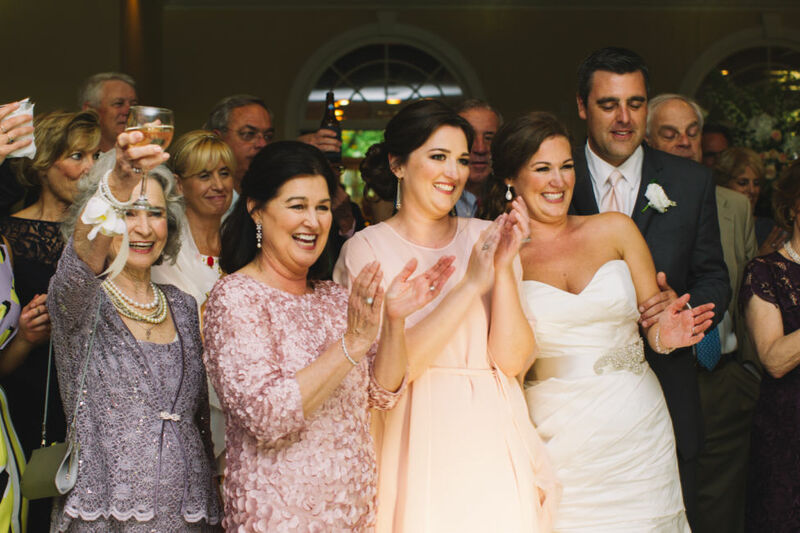 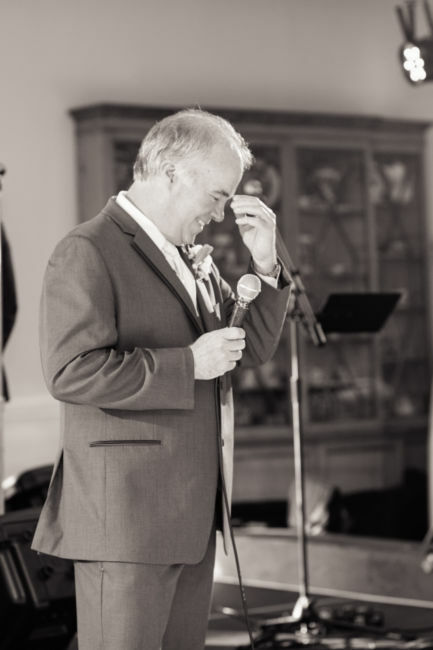 The Texas influence of Daren’s family home and now Evelyn’s was highlighted in several ways: “And they lived happily ever after” was printed on a Texas State cutout behind the 4-tiered wedding cake and a Texas state flag was hanging from the back porch. 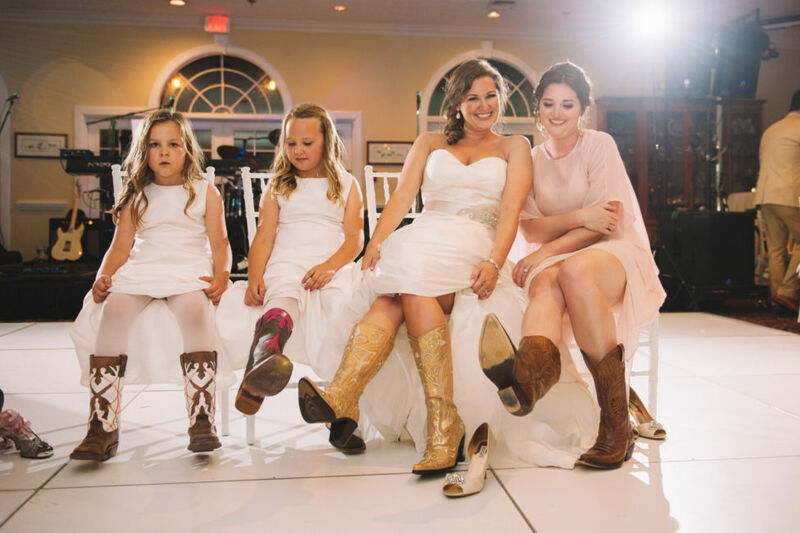 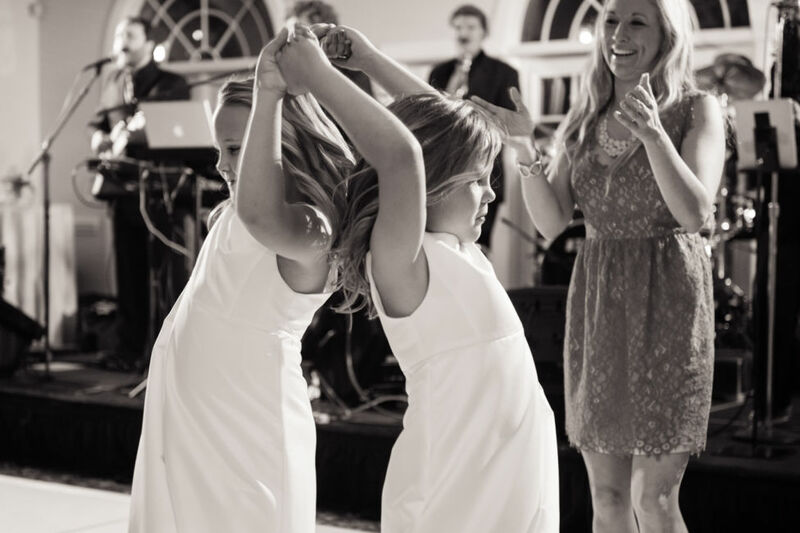 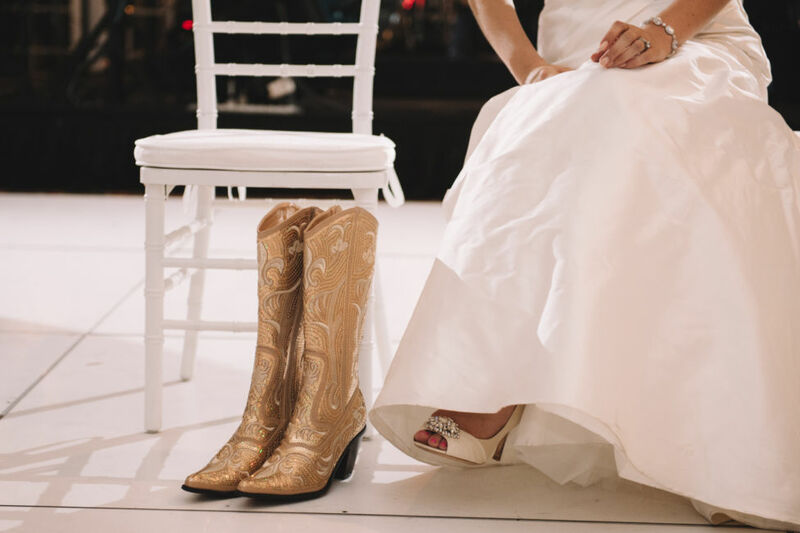 The “Carolina Girls” and Texas flower girls donned their cowboy boots while the groom and his guys took the stage and sang a song to Evelyn. 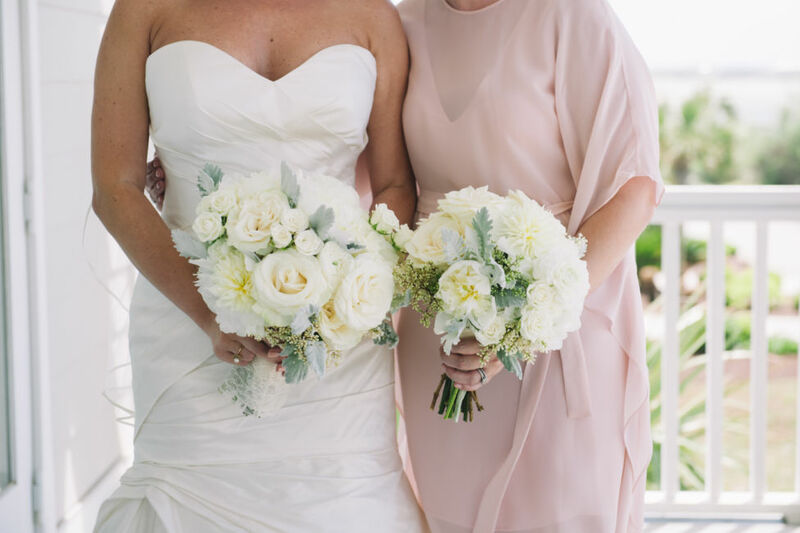 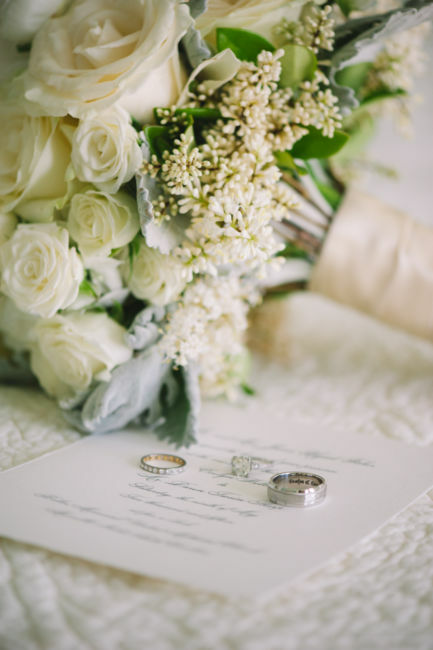 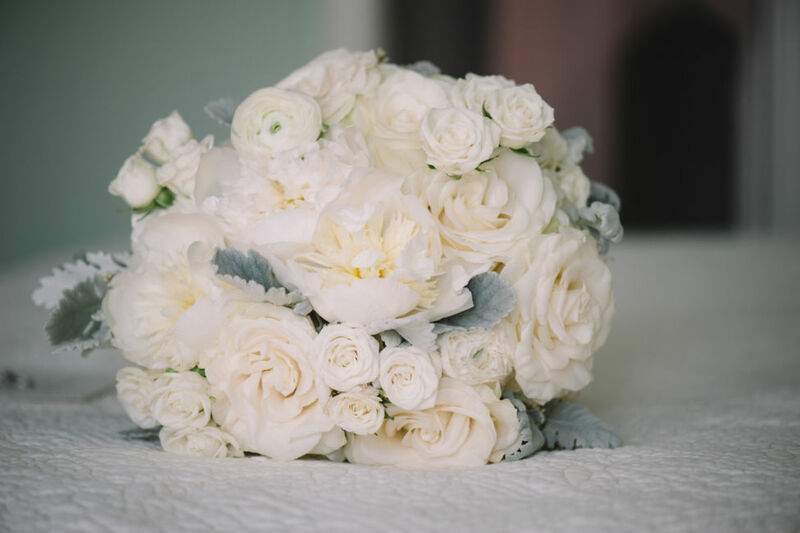 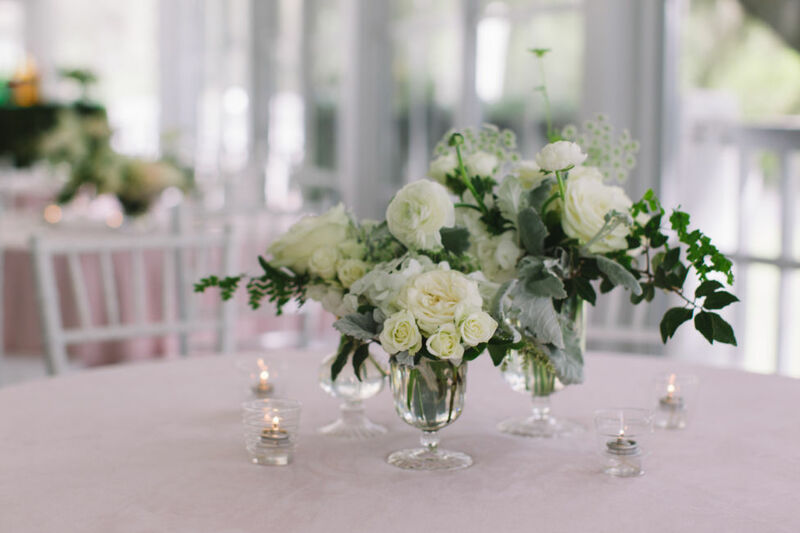 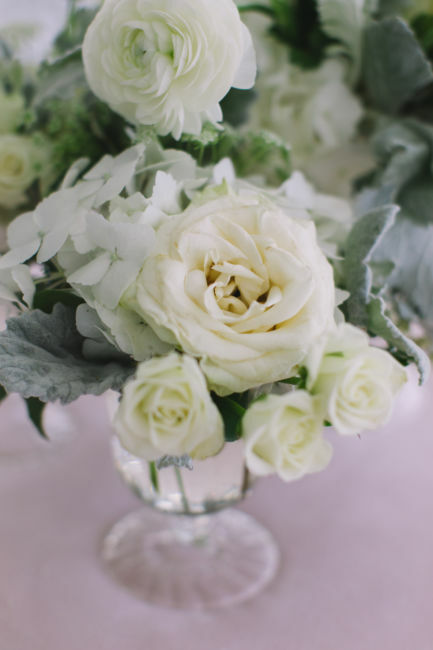 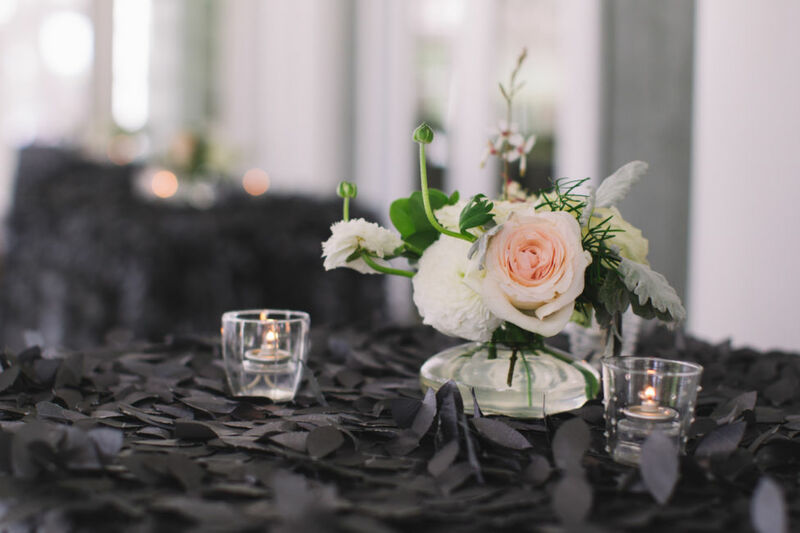 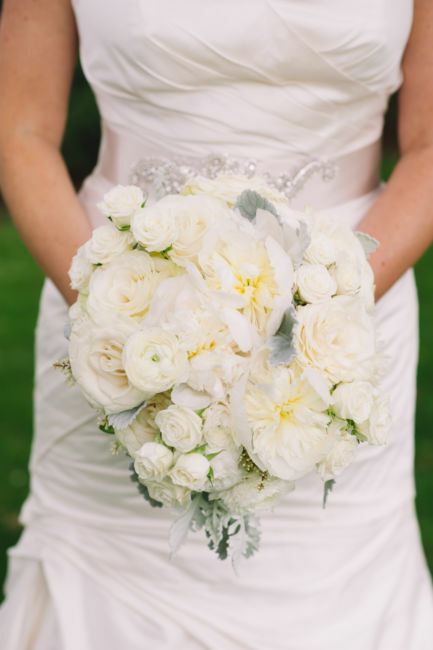 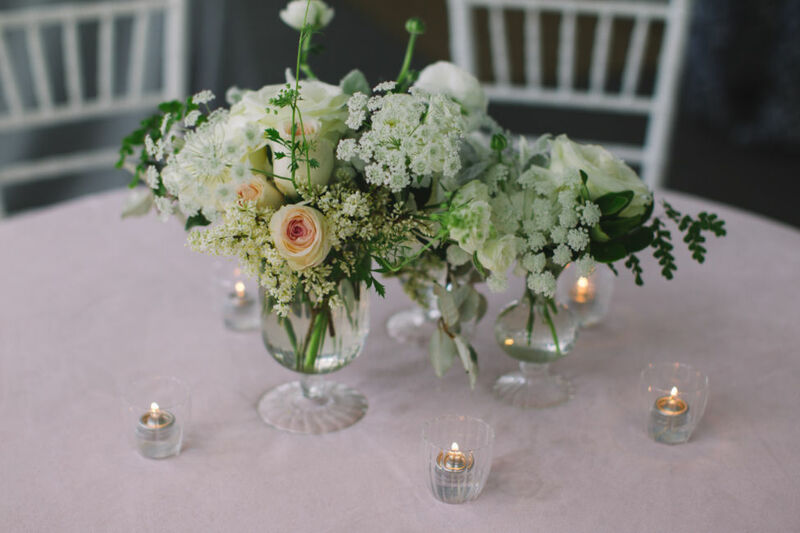 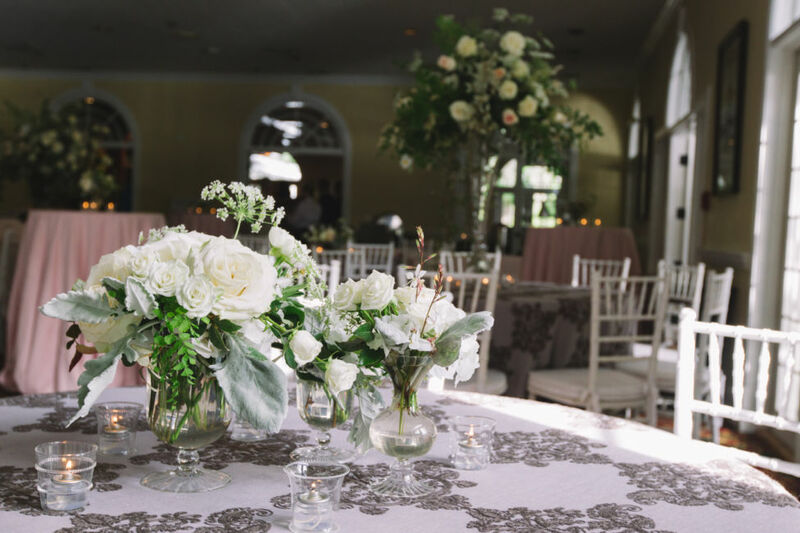 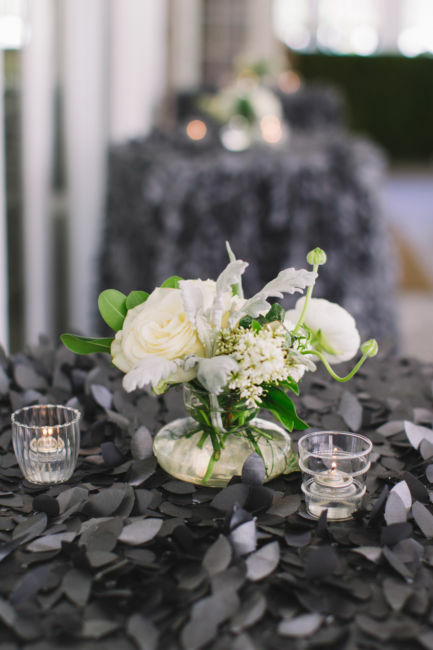 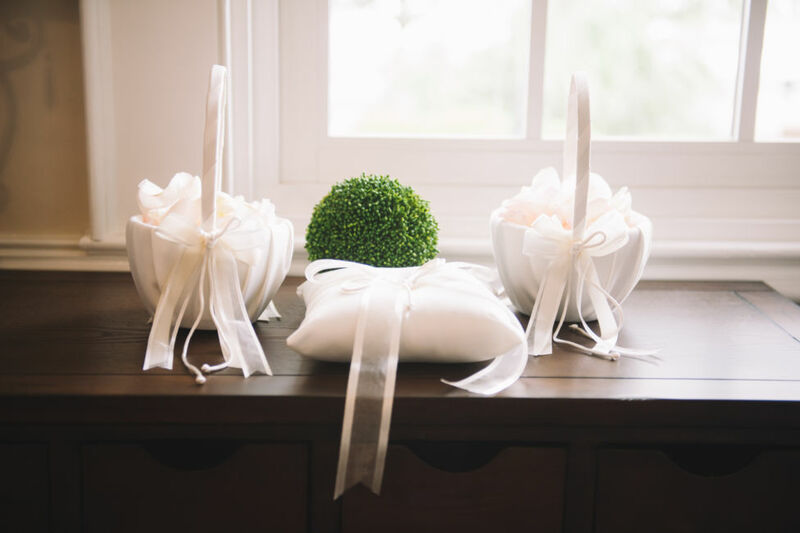 The abundant white flowers skillfully arranged and delicate glass vases and votives were the perfect touch to the romantic atmosphere in all the reception rooms. 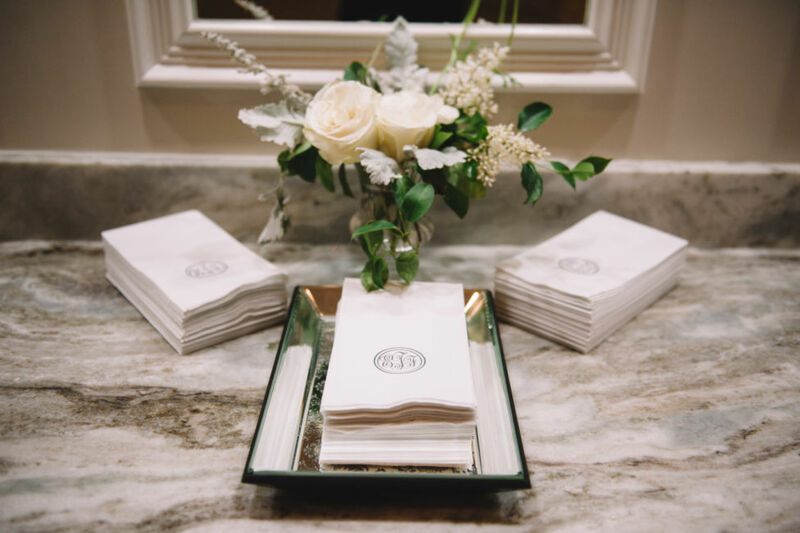 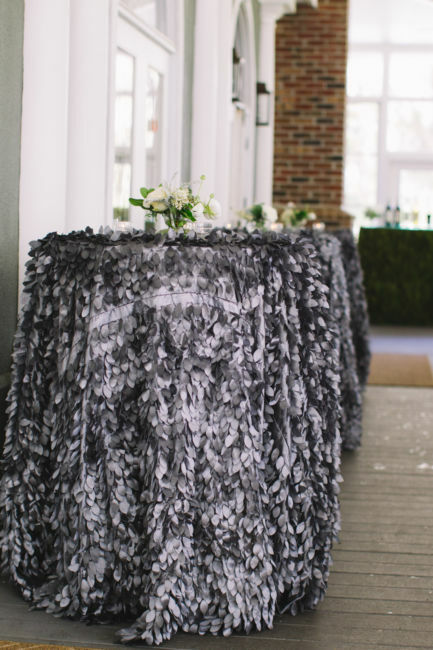 The very feminine table cloths were provided by the sister of the bride. 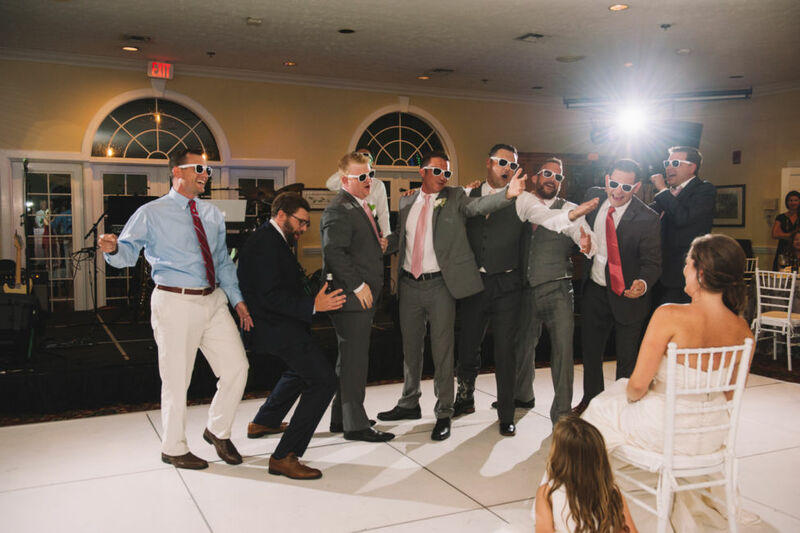 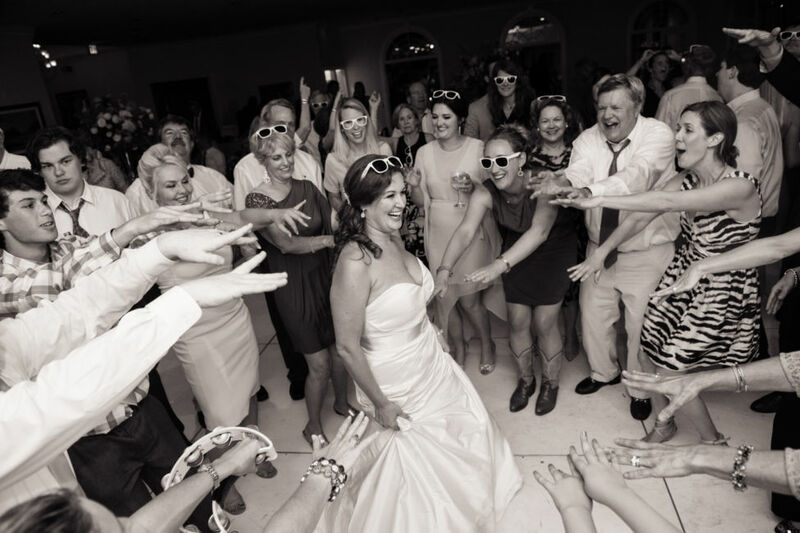 From beach music, to country, to rock numbers, the band, “In The Pocket” did a fabulous job entertaining everyone and made the reception a night to remember! 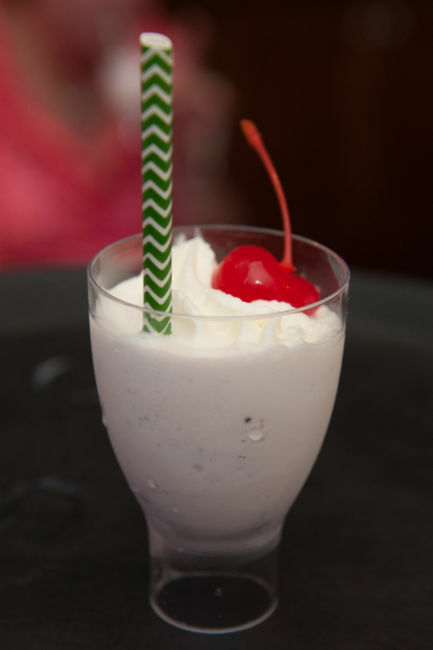 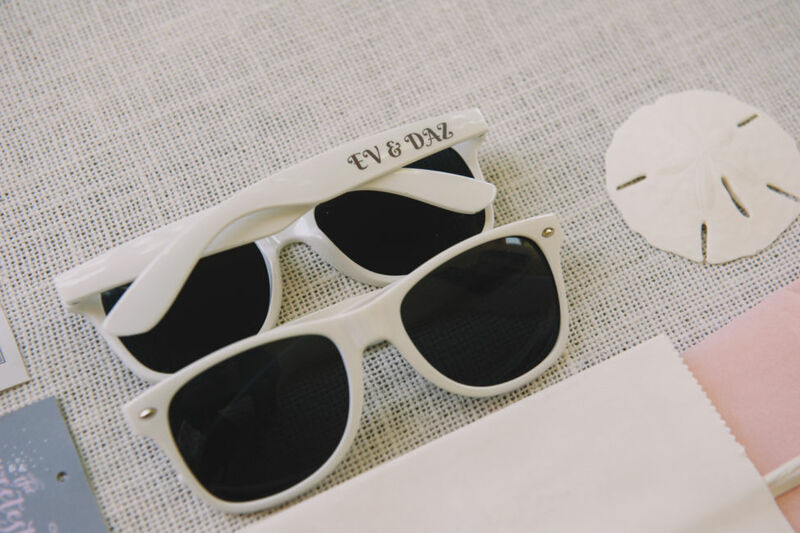 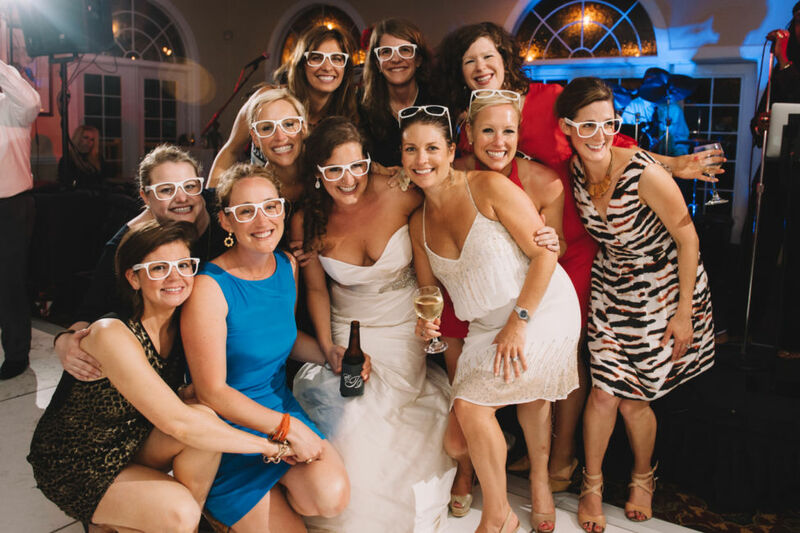 The white framed sunglasses, late night snacks offered to guests including a milkshake(!) 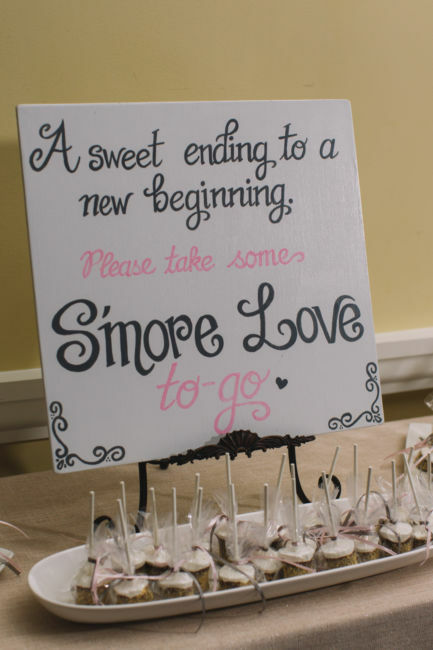 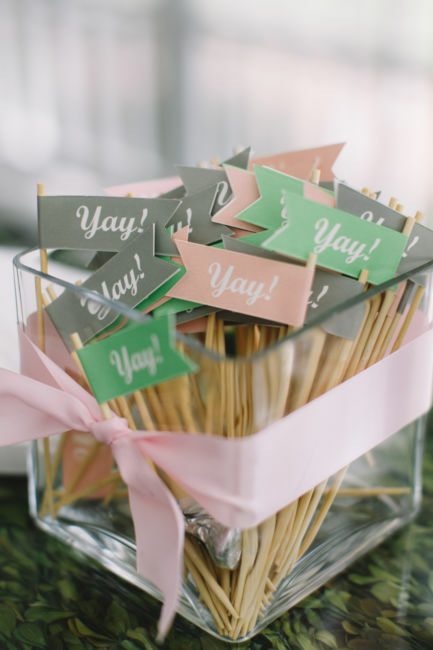 and handmade lollipops – S’more Love to go – topped off the fun had by the young and the young at heart. 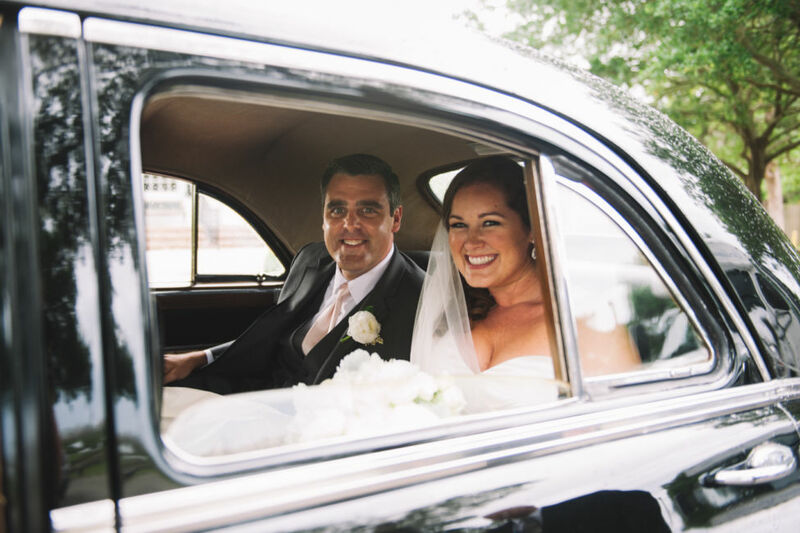 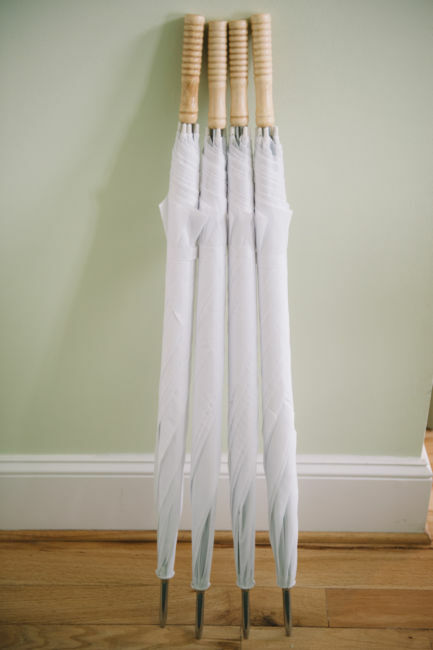 Evelyn and Daren departed in the rain absolutely giddy with happy smiles and the look of love! 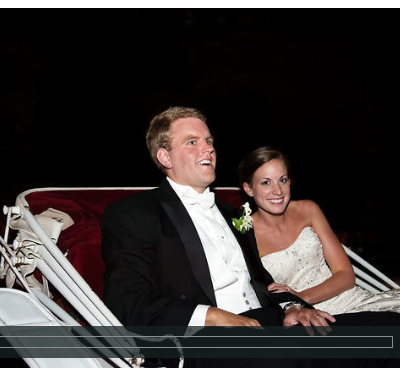 It was a true pleasure to photograph your festivities, Evelyn and Daren, and get to know your families! 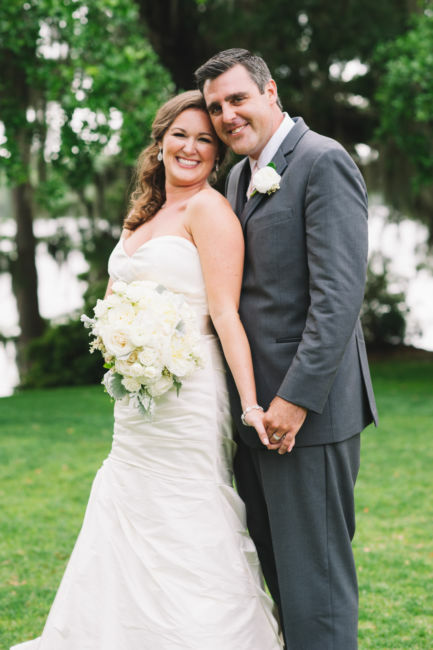 A special thanks to Gillian Claire for assisting me!